Well it is almost time for that day of love, Valentine’s Day. It is a day that I look forward to every year; I can’t think of a better way to spend my time than with my beautiful wife. Now in past years Valentine’s Day would include the two of us going out to some overcrowded restaurant for a nice dinner together. At some point though, we both realized that doing the whole dinner out thing on Valentine’s Day never really lived up to expectations. The restaurants are crowded (it is one of the busiest days of the year for them). There is always a wait, reservations or not, and the staff is always a bit harried. Not really the romantic dinner that one invisions when thinking about Valentines Day. That is why this year we are staying in and cooking dinner ourselves, and in order to make things as simple as possible, I created this Penne Chicken and Sweet Pepper Tomato Cream pasta dish by mixing mixing Bertolli® Organic Traditional Tomato & Basil Sauce together with Bertolli® Organic Creamy Alfredo Sauce! 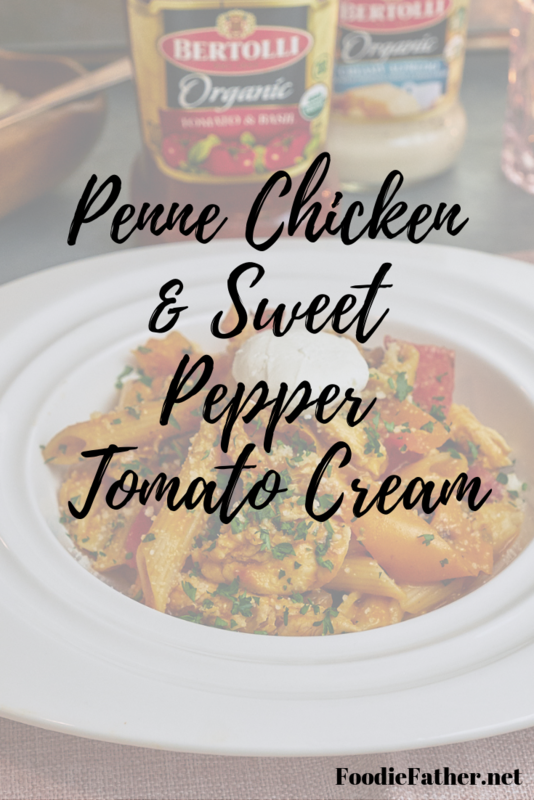 We hope that you enjoy this Penne Chicken and Sweet Pepper Tomato Cream Recipe post. Bertolli® has been in the Italian food game for over 150 years, and it shows in their products. 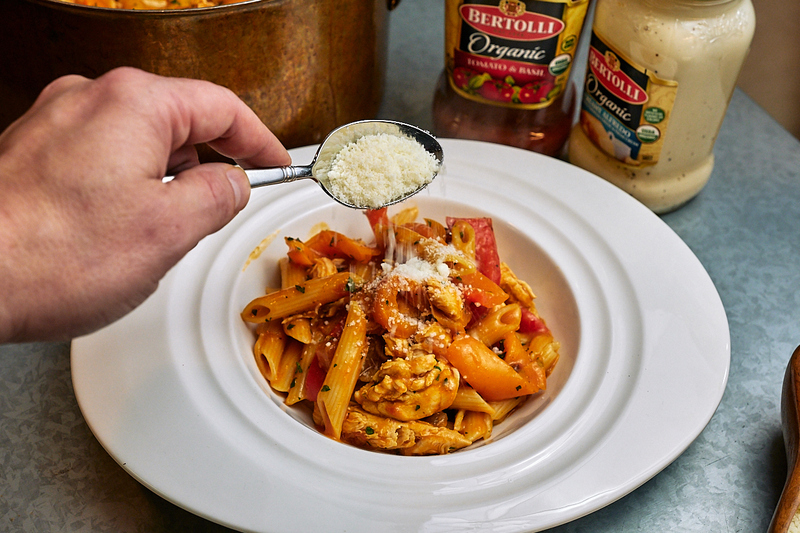 All Bertolli® Sauces start with high quality, real ingredients like vine ripened tomatoes, Parmesan cheese, and Extra Virgin Olive Oil. 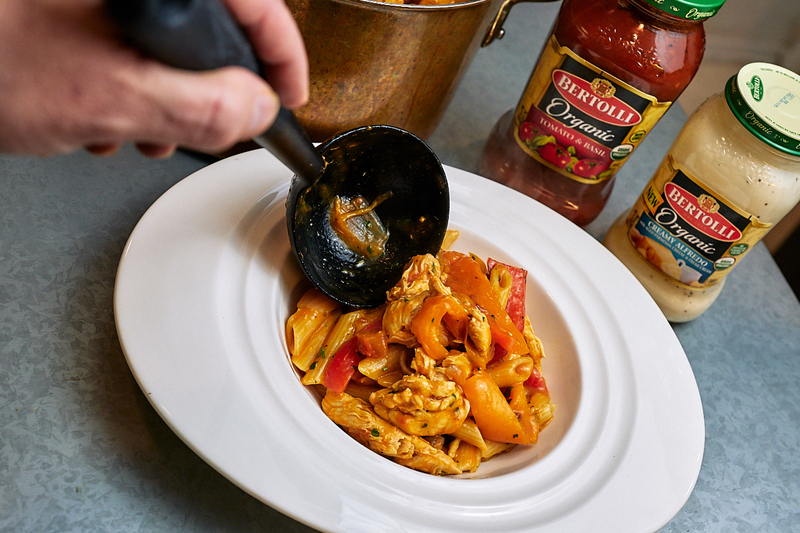 For our pasta dish, we used the Organic Bertolli® line of sauces. Featuring non-GMO all organic ingredients, these sauces feature bold fresh flavors that really do taste authentic. 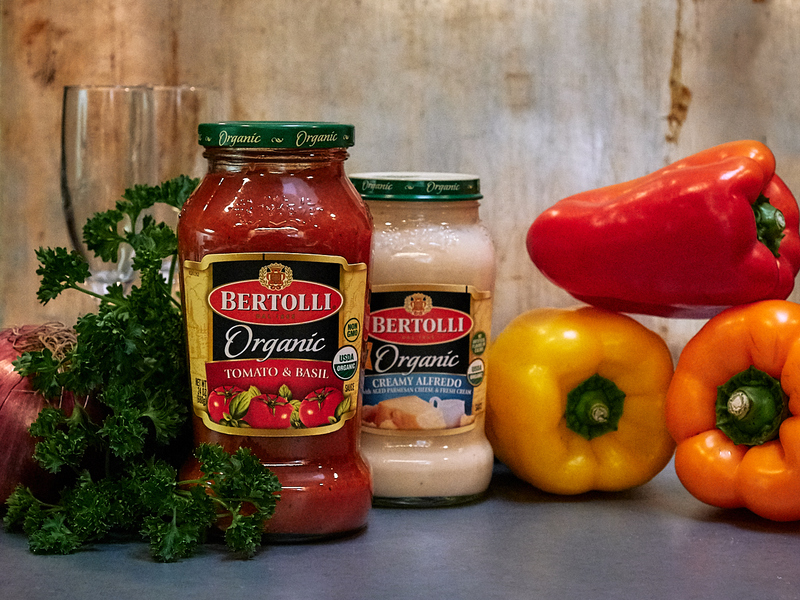 For our Valentine’s Day dinner, we decided to make a Tomato Cream Sauce, which is very easily achieved by mixing the Bertolli® Organic Traditional Tomato & Basil Sauce together with Bertolli® Organic Creamy Alfredo Sauce. It is so easy it almost feels like cheating. Alright, we have our ingredients together. Lets go ahead and create something tasty! Add your olive oil to a large pan and heat over a medium flame. 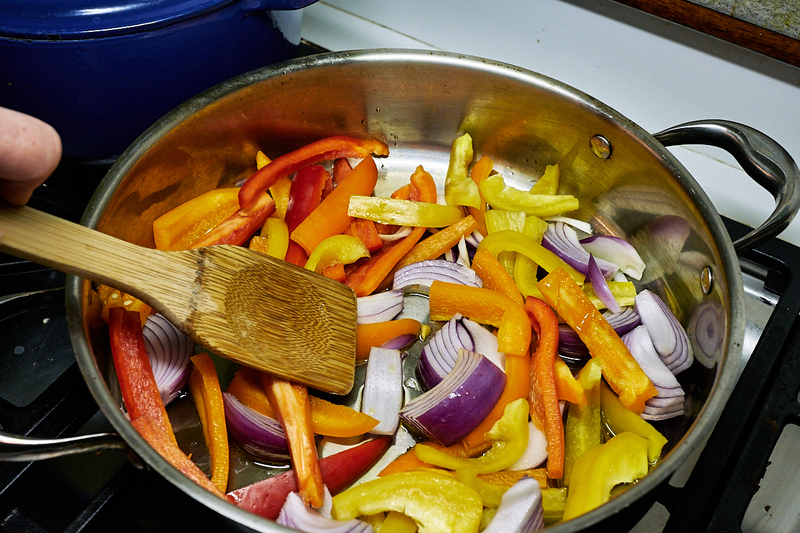 Once the oil is hot, add the onions and peppers. Saute this mixture for about 5 minutes. We want to start softening those veggies. While that is cooking, go ahead and season the chicken with salt and pepper. Once the onions and peppers begin to soften, add the chicken to the pan. Cook for about 8 minutes, stirring occasionally. 2. Once the chicken cooked on the outside (it’s ok if you still have some raw looking pieces), add the white wine. Let this cook uncovered for about 5 minutes, stirring occasionally. 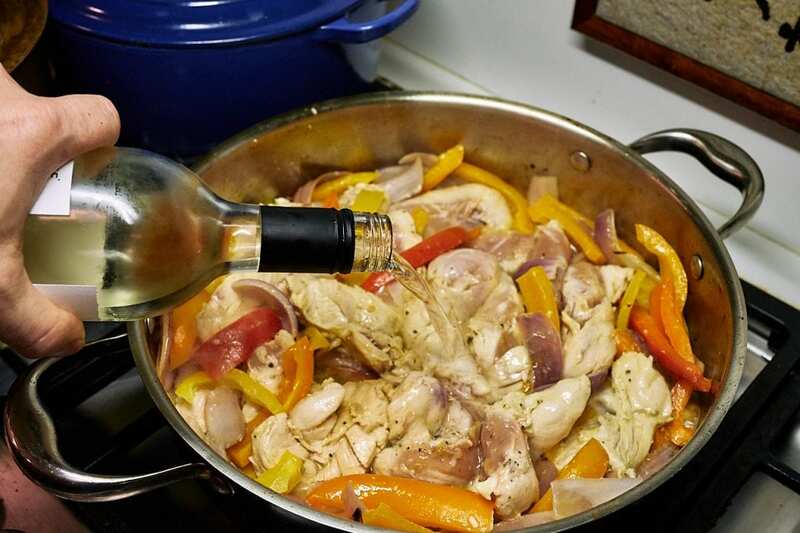 The goal here is to cook of the alcohol and reduce the wine a bit. 3. 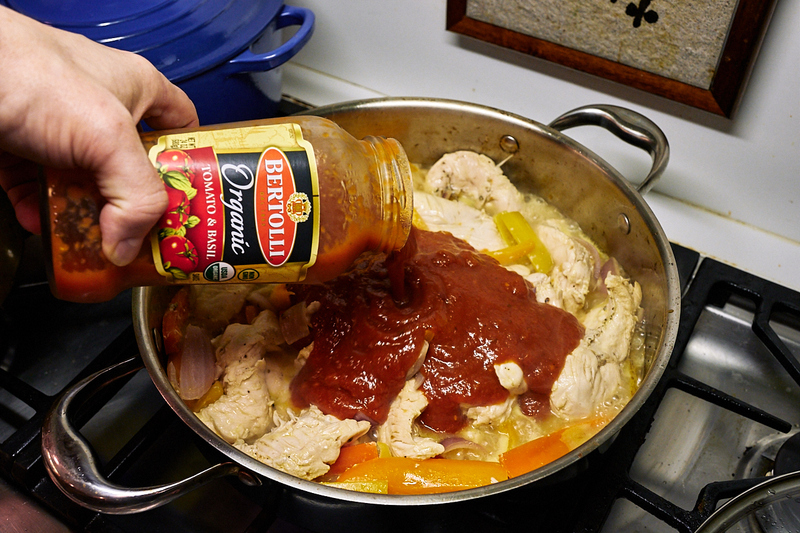 Next add the Bertolli® Organic Traditional Tomato & Basil Sauce. Go ahead and give things a stir, coating everything in the pan with the sauce. 4. 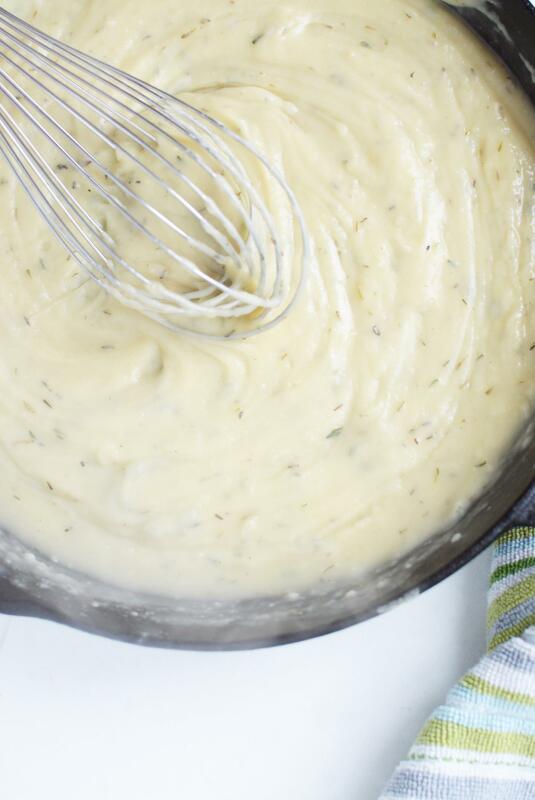 Now go ahead and add the jar of Bertolli® Organic Creamy Alfredo Sauce. 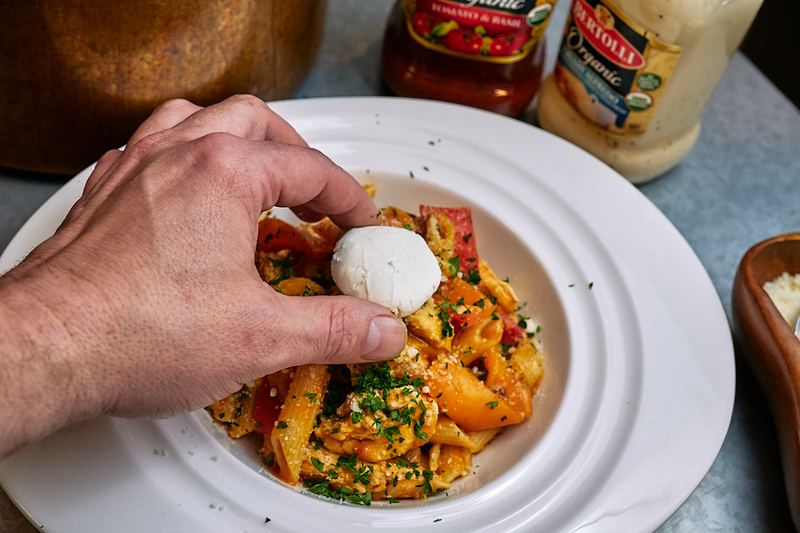 Mix everything together and pat yourself on the back…you just made Sugo Rosa Sauce (aka tomato cream). Now cover the pan and turn down that flame. We want to slow simmer the sauce for about 15-20 minutes. While that is happening, go ahead and cook your pasta according to the directions on the packaging. Try to time things so your pasta is done cooking when the sauce is done simmering. This way you don’t have to rinse and cool the pasta. Anyway, once the pasta and sauce are ready, mix them together. We are almost done here….time to plate! 5. 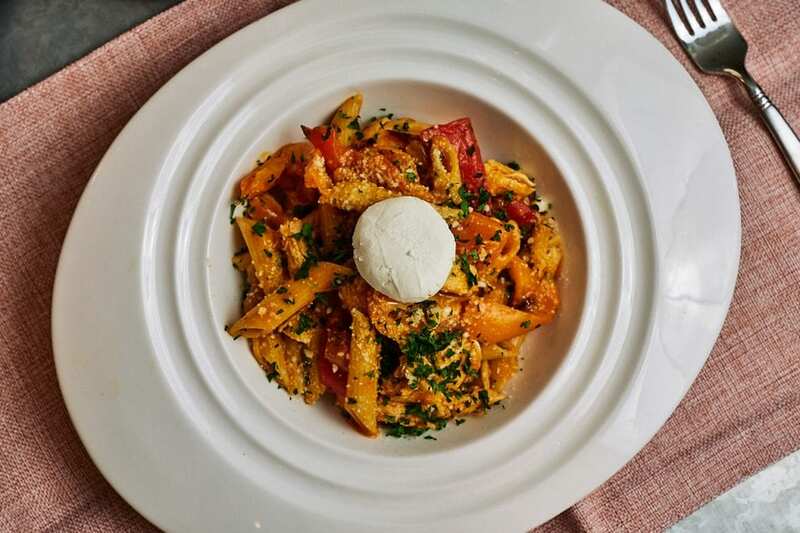 Ladle your mixed Penne Chicken and Sweet Pepper Tomato Cream into a pasta bowl. 7. Finish off the dish with a sprinkling of chopped parsley and one goat cheese disk. That’s it! I truly hope you enjoy the Penne Chicken and Sweet Pepper Tomato Cream recipe. 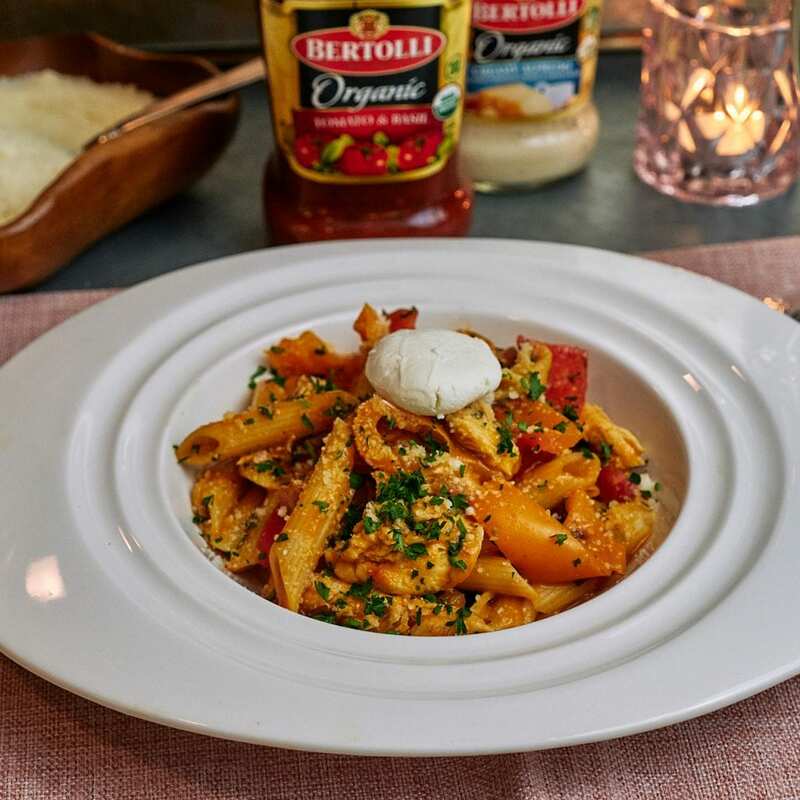 It really tastes wonderful, and the Bertolli® Organic Sauces really shine. 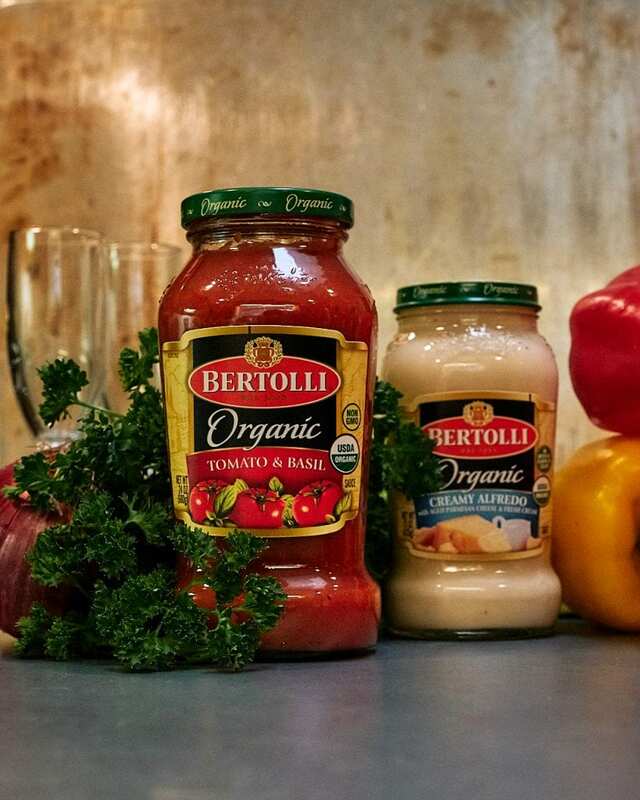 If you would like to learn more about Bertolli®, check out their website. It is chock full of recipes and useful information. Until next time, happy cooking, and have a fantastic Valentine’s Day. Breakfast is my wife’s most favorite meal. She loves everything about breakfast and can pretty have it any time of day. 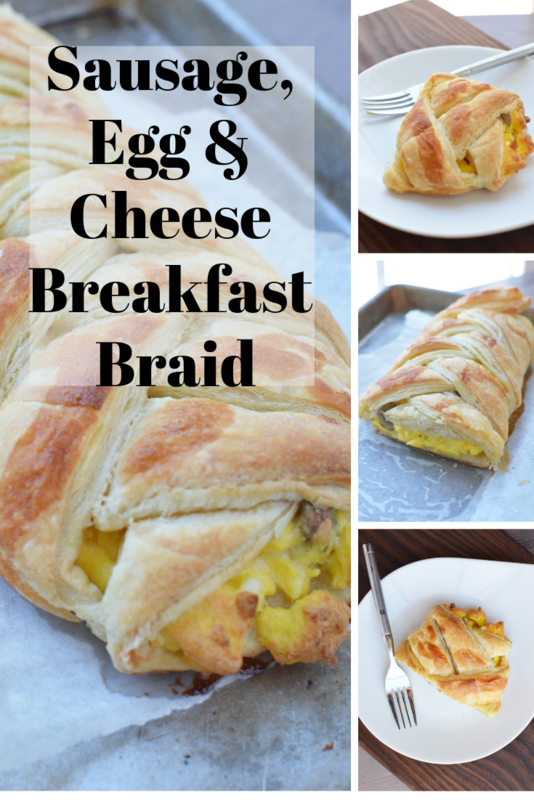 We hope that you enjoy this Sausage Egg and Cheese Breakfast Braid. Start by beating and cooking the eggs, add in the cooked sausage and cheese at the end of cooking the eggs. You may want to slightly under cook the eggs vs slightly over cook them just to make sure they aren’t too dry after baking. 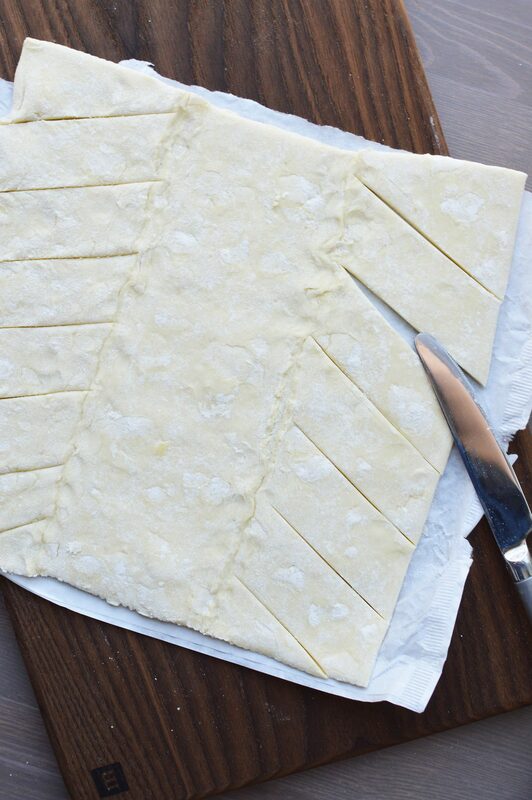 Prepare the pastry sheet by laying out on parchment paper and unfolding. Use a knife to cut slits in the sheet on each side of the center, do not cut away from the center, see photos. 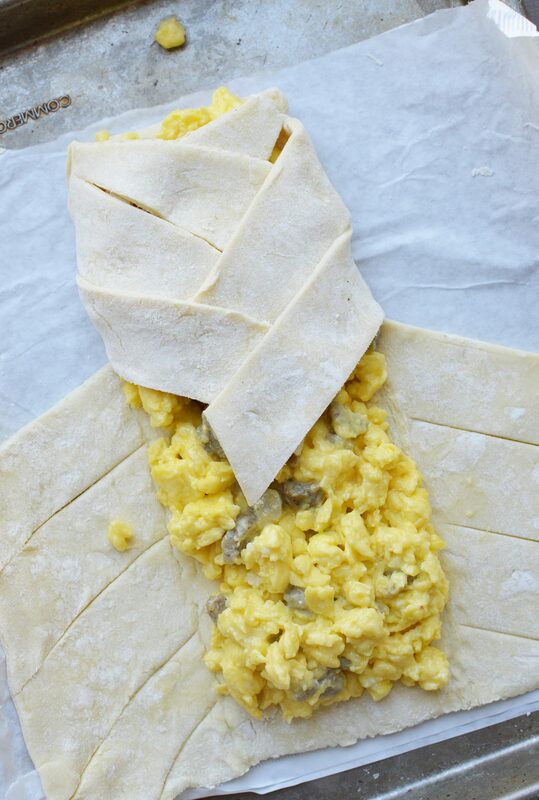 Place the cooked egg scramble into the center uncut portion. Start at the top and fold one side over the egg then fold the other side over that first one. Go back and forth until you are down at the bottom, tuck in the bottom two pieces into the rest of the layers (again, see photos for technique). 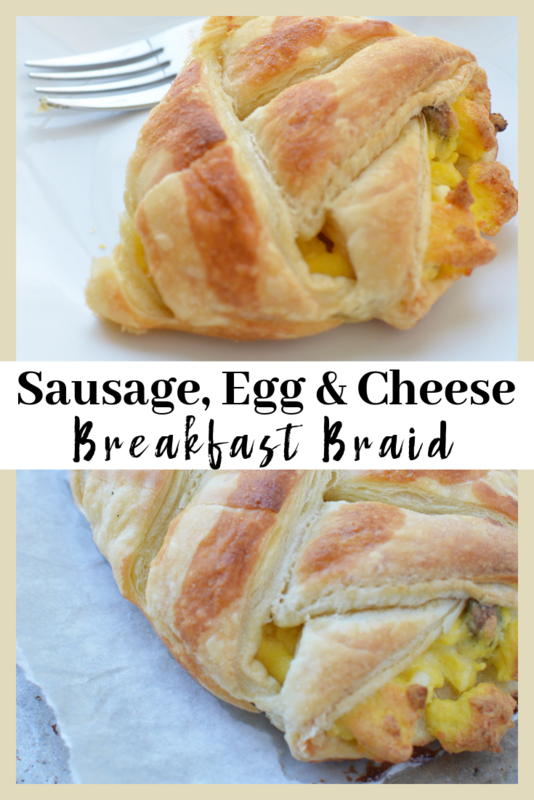 If you would like, drizzle a little pure maple syrup over the top of the finished braid. It adds a great flavor but my kids don’t like it. Adults love it. Place in the oven at 400 degrees and immediately reduce the heat down to 350 degrees. 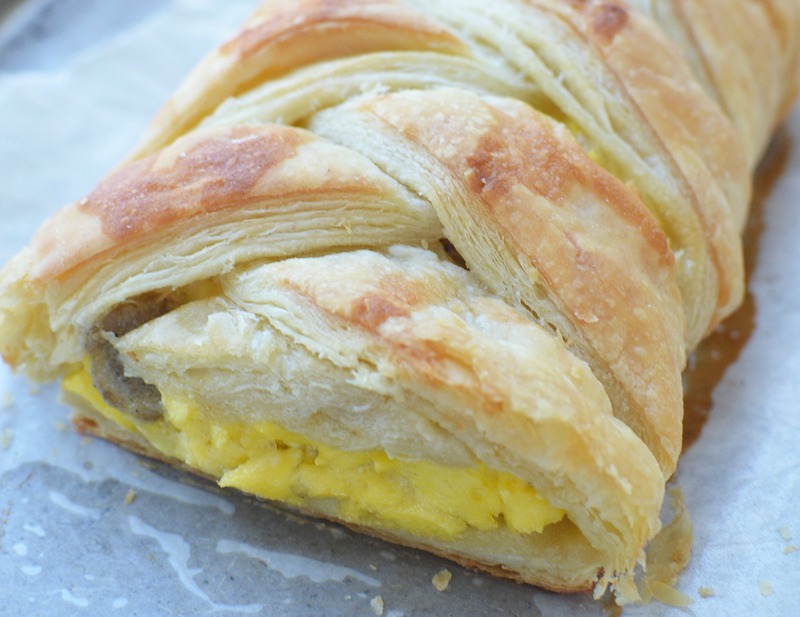 Bake for about 25 to 30 minutes until the puff pastry has really puffed up all the way around. Around the 18 minute mark I covered it with tin foil to make sure it wouldn’t brown too much. 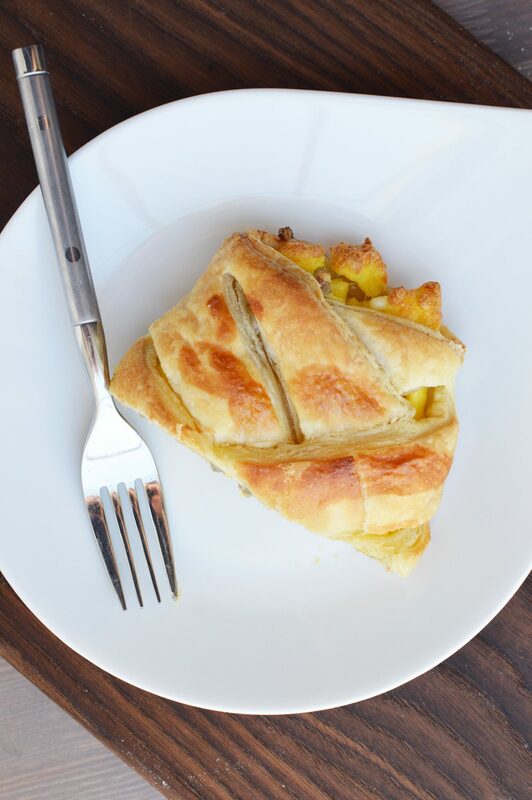 As tempting as it may be once it starts to look golden on top, it will definitely be worth waiting for the pastry to bake all the way through. Let cool for a few minutes before cutting into and enjoying. 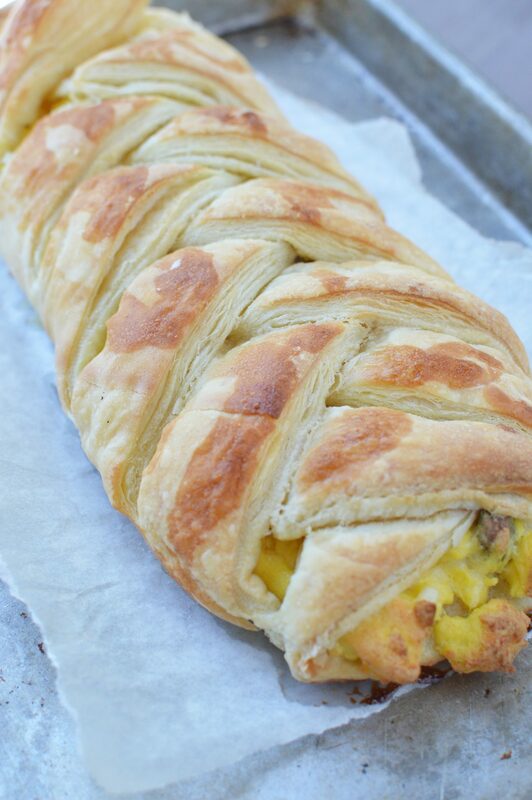 We hope that you are inspired by this Sausage Egg and Cheese Breakfast Braid post. Happy cooking! Nothing says hearty to me like a nice roast. I grew up having a roast dinner every single Sunday and my wife did as well. Every single Sunday, we have a family meal and being the carnivores that we are, this meal always features some of my favorite cuts of meat. 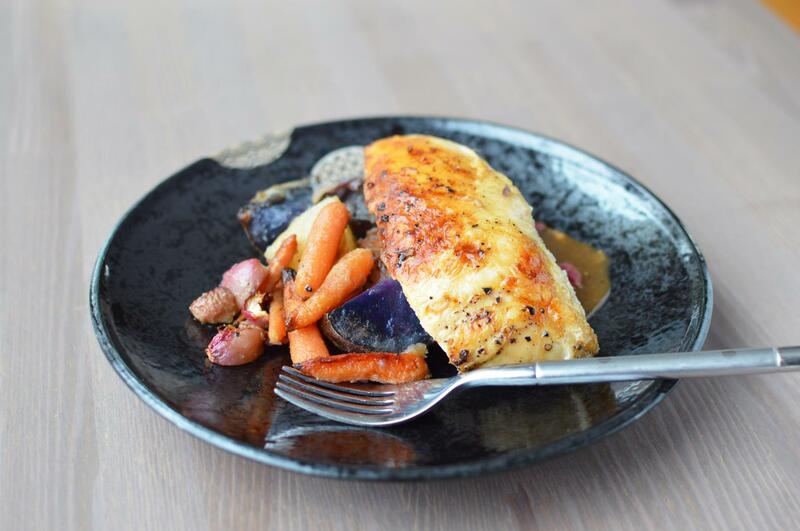 We hope that you enjoy this Herb Rubbed Roast Recipe. 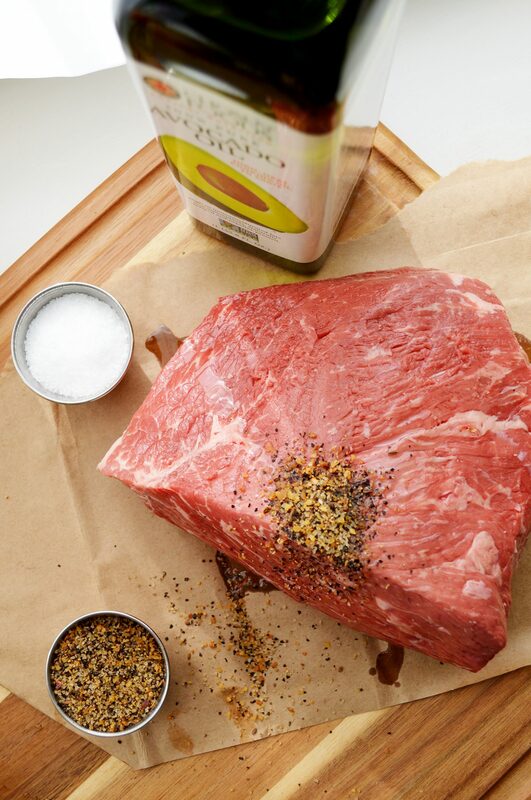 Start by coating the meat in a the avocado or olive oil then rub in the Montreal steak seasoning so it covers most of it. 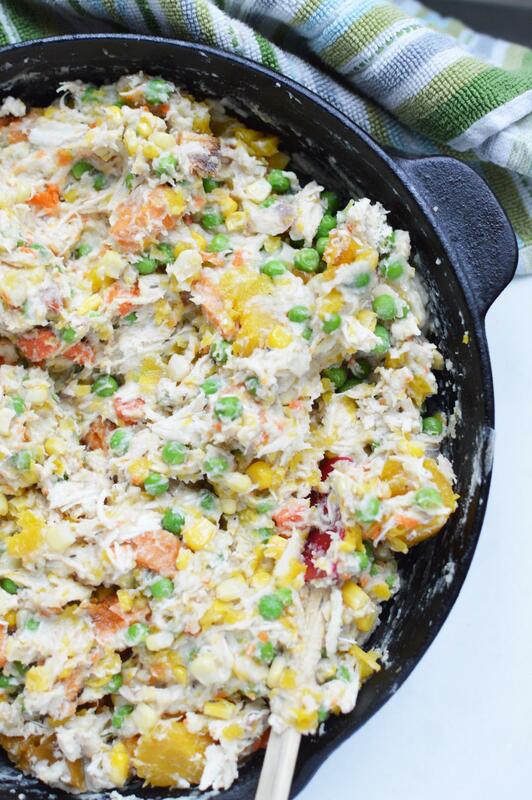 Place in a gallon sized freezer bag (or right into your crock if cooking now). 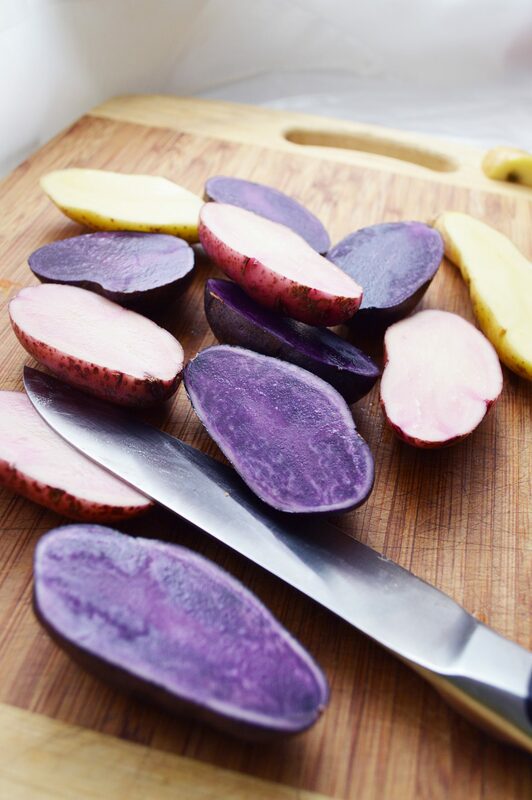 Scrub the potatoes with a brush and dry completely before slicing in half the long way and placing in the bag. 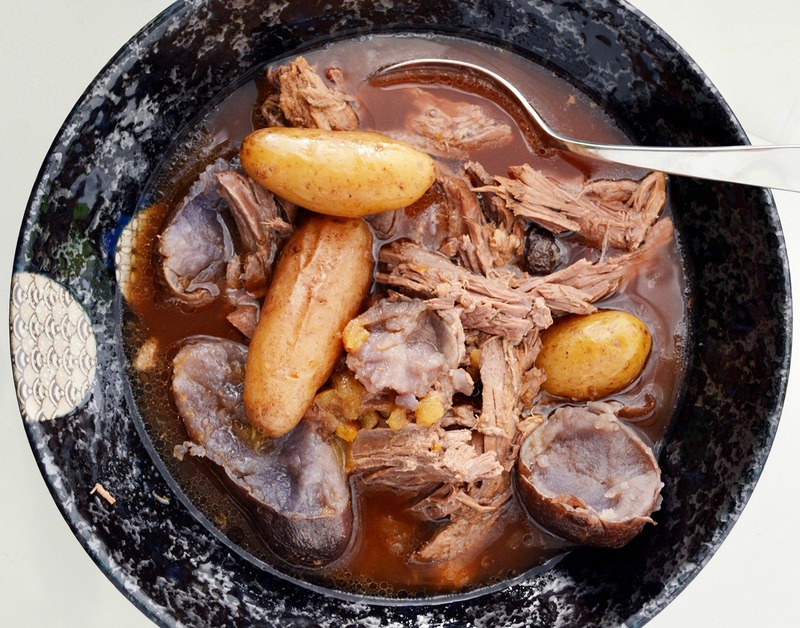 When ready to cook add 3 cups of stock, preferably beef stock, ¼ cup of A1 or steak sauce, 3 tablespoons of Worcestershire sauce, 3 large garlic cloves and 1 cup of dry red wine into the crock. Whisk together before placing the meat in and topping with the potatoes. Make sure the liquid covers the meat and most if not all of the potatoes completely. Cook on low for 6-9 hours depending on size or until the meat is fork tender. Let cool for a few minutes in dishes before serving. 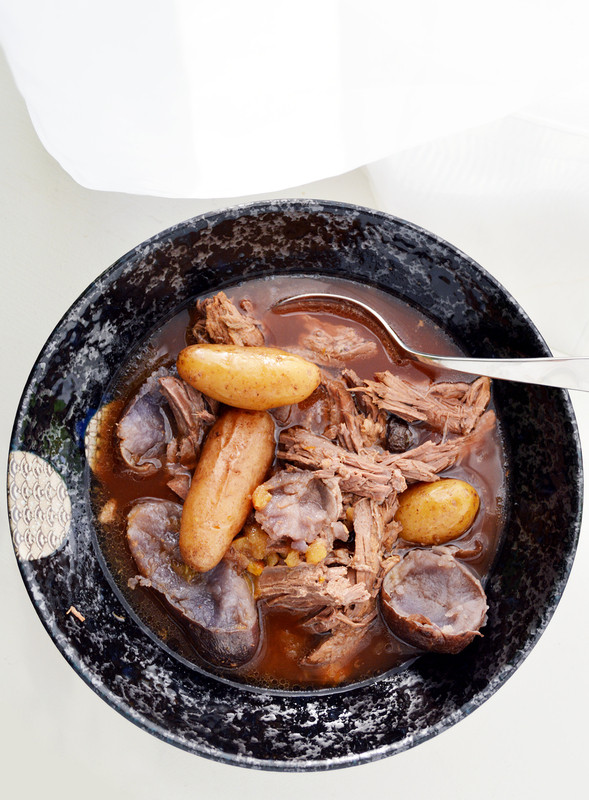 This roast is so good and so versatile. Sometimes I make extra and make sandwiches the next day or freeze the leftovers for a future meal. No matter how I make it, everyone loves it and this roast quickly became the most asked for meat recipe in our home. 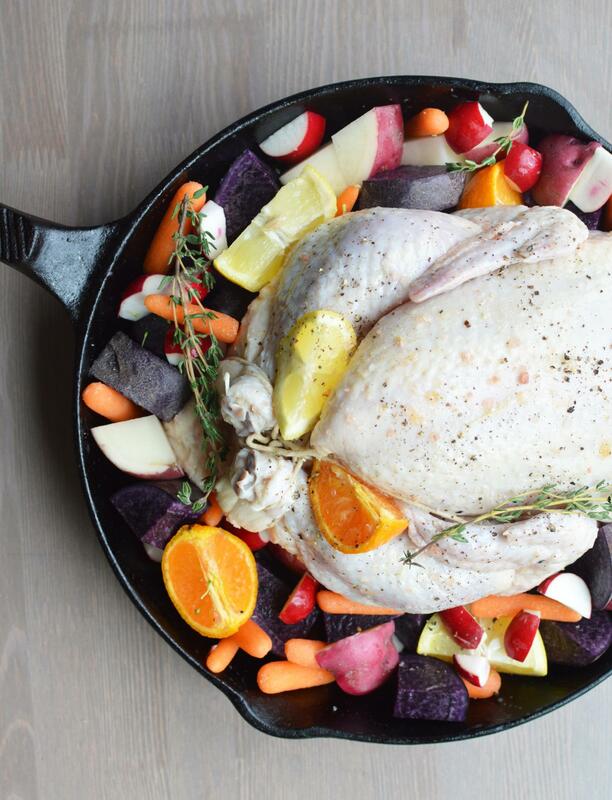 We hope that you loved the Herb Rubbed Roast Recipe. 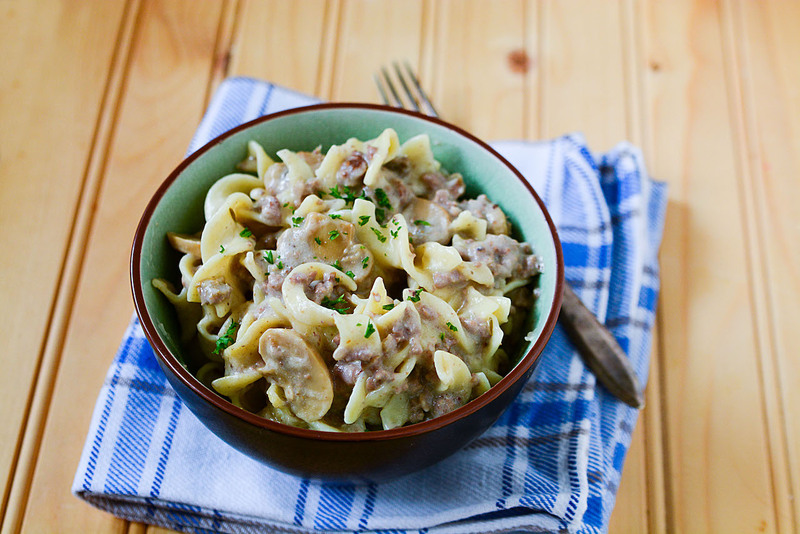 Beef Stroganoff is one the most delicious dishes that I have ever made. 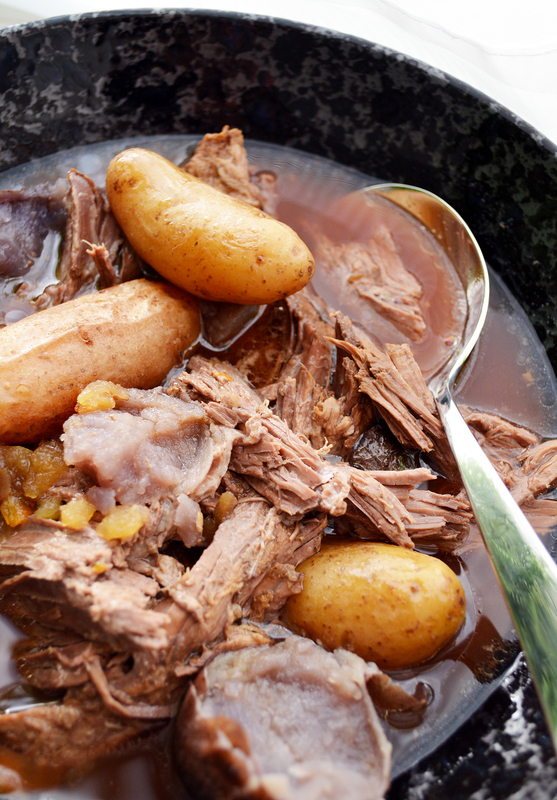 It’s hearty, delicious and so easy to make in your slow cooker. 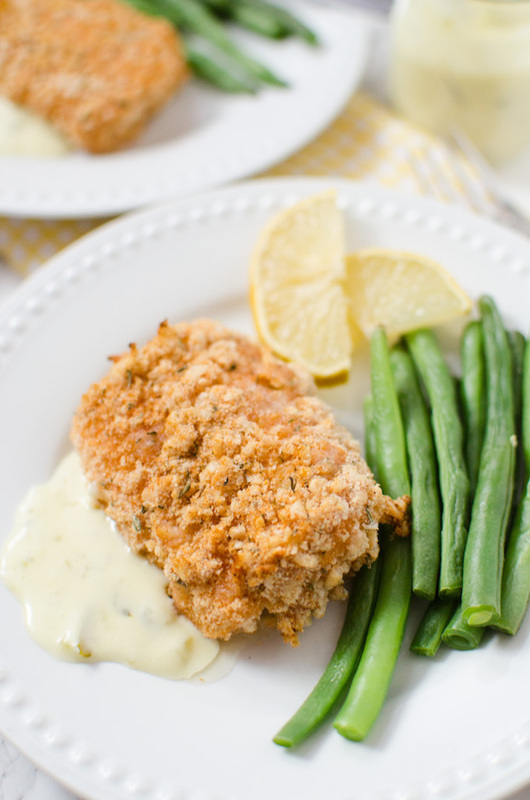 What I especially love is that this recipe is so versatile that it is perfect for any season. 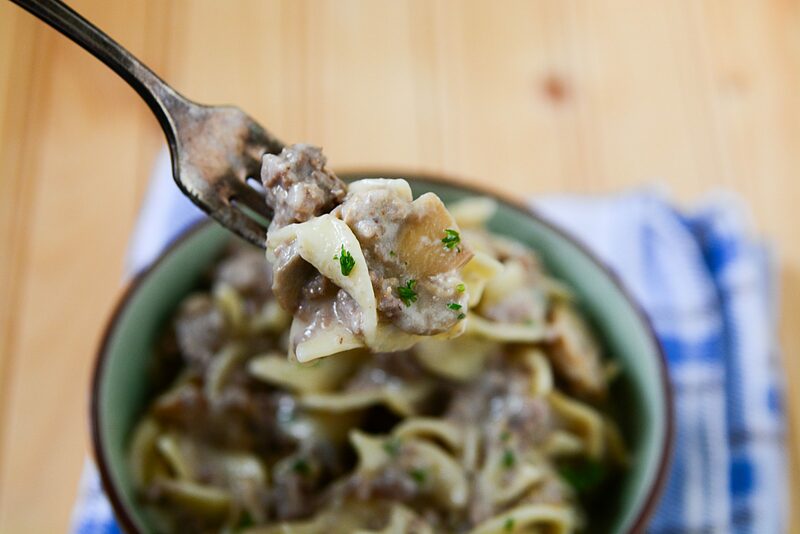 It makes a great winter meal when everyone wants to stay in and stay warm. It is also perfect for summer because you don’t have to use any of your appliances that will heat up your kitchen. Instead everything is made in your crockpot after the initial beef browning which means you can walk away and deal with more important things. 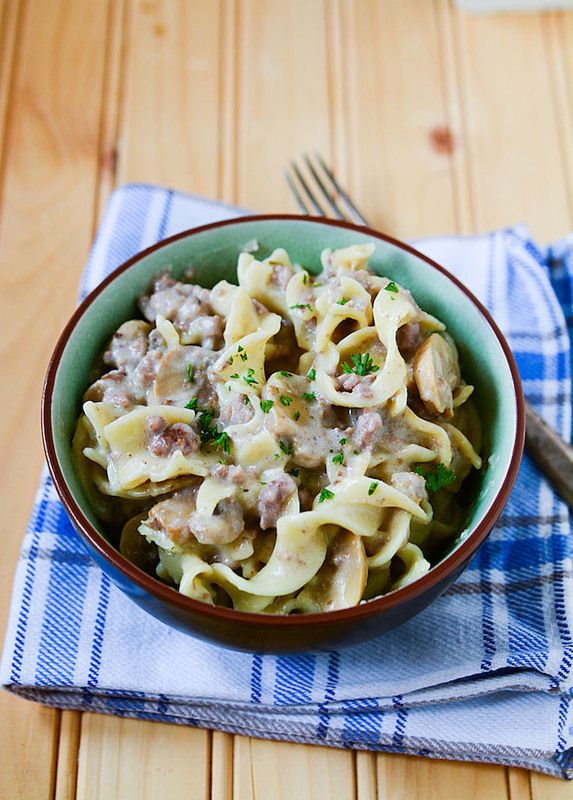 This recipe makes enough for four people but we usually double it and throw the leftovers in the freezer for a future leftovers night which of course everyone fights over this stroganoff. 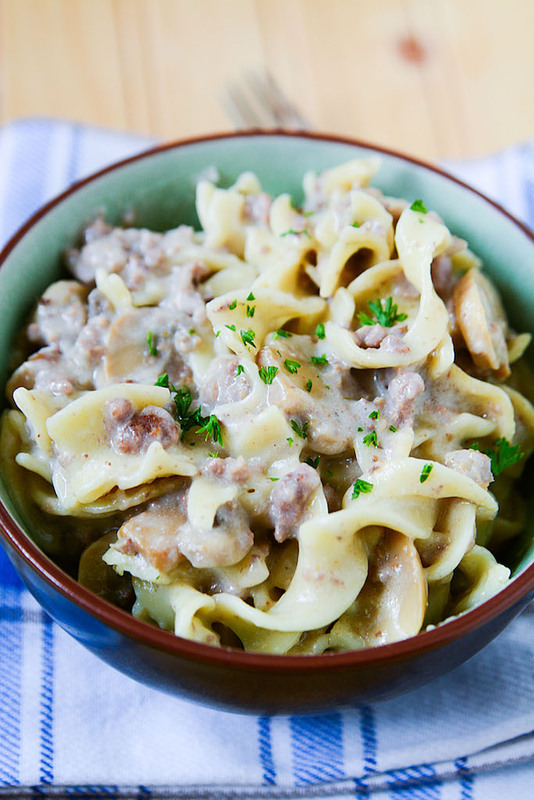 You can also substitute with steak or some other sort of meat like chicken if you want to elevate this recipe. When I find fresh mushrooms, I use those as well. 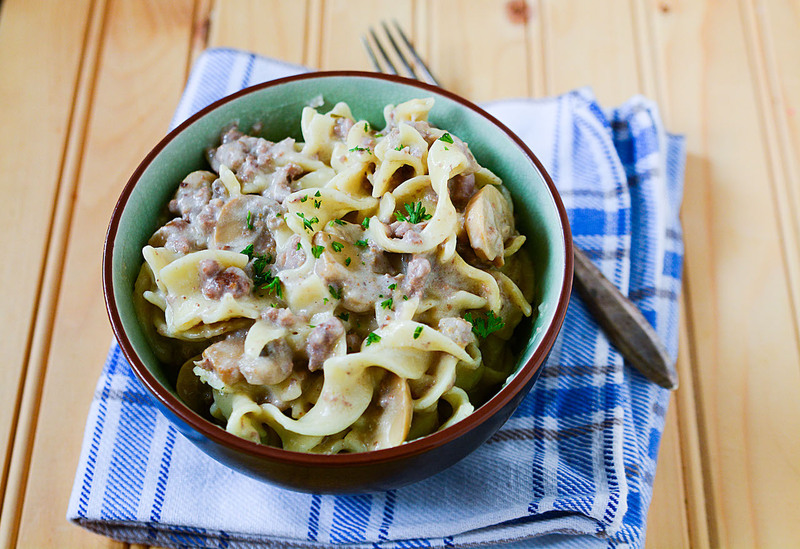 We hope that you enjoy this Crockpot Beef Stroganoff Recipe. 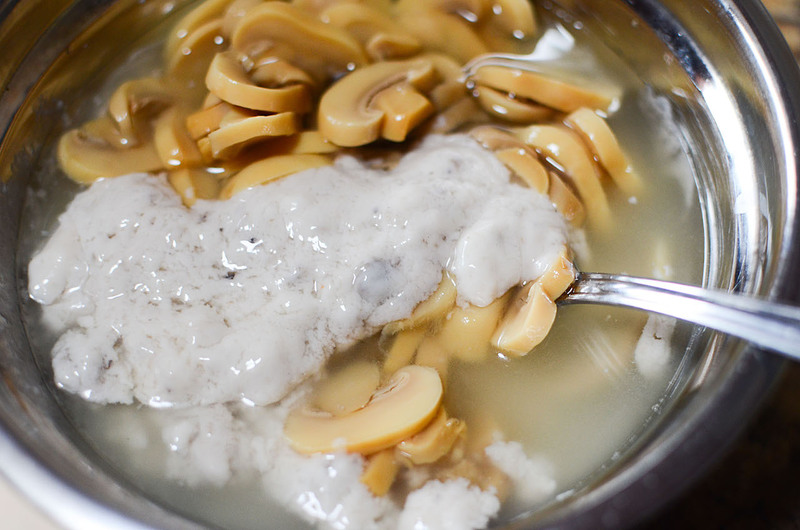 In a bowl, combine the chicken broth, mushroom soup and mushrooms. Mix well. Pour the mixture over the beef and mix well. Transfer the mixture into the slow cooker. Cook on low for 3 – 4 hours. In the last 15 minutes of cooking, cook the noodles according to the package directions. 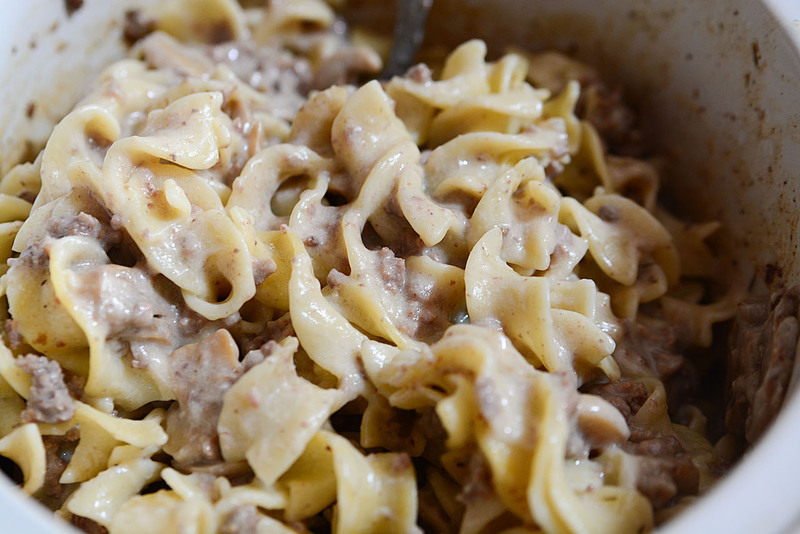 When the noodles are cooked, drain the pasta and add to the slow cooker. 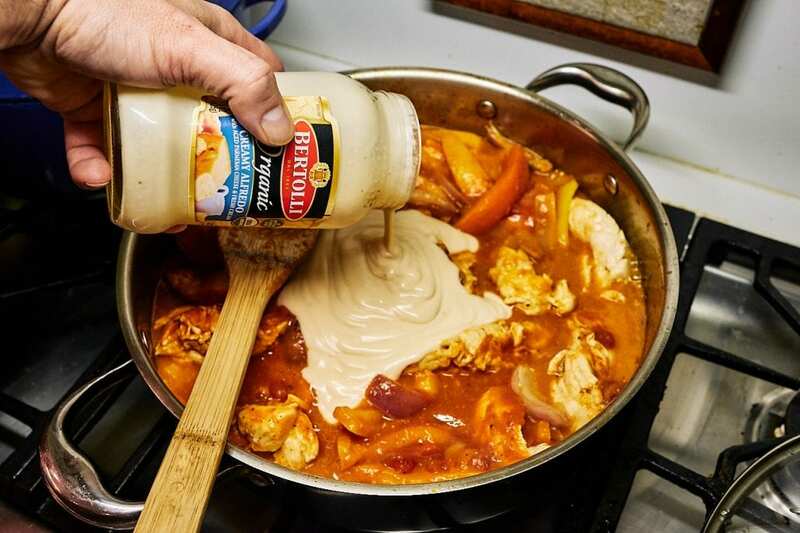 Mix well, and add the sour cream as well. 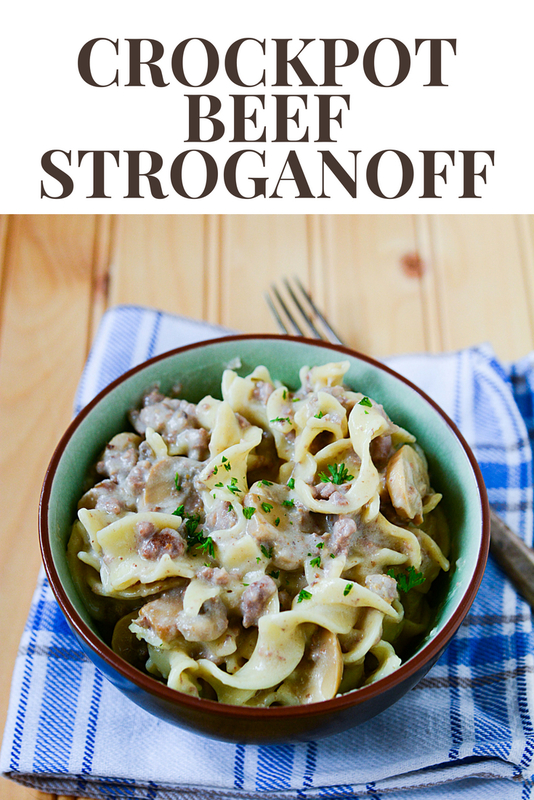 We hope that you love our Crockpot Beef Stroganoff Recipe. 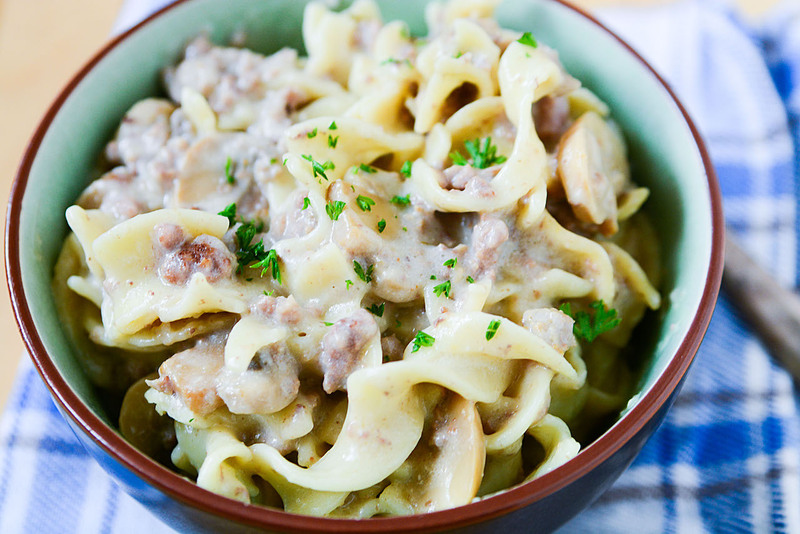 Winter is here and for my family that means comfort food. 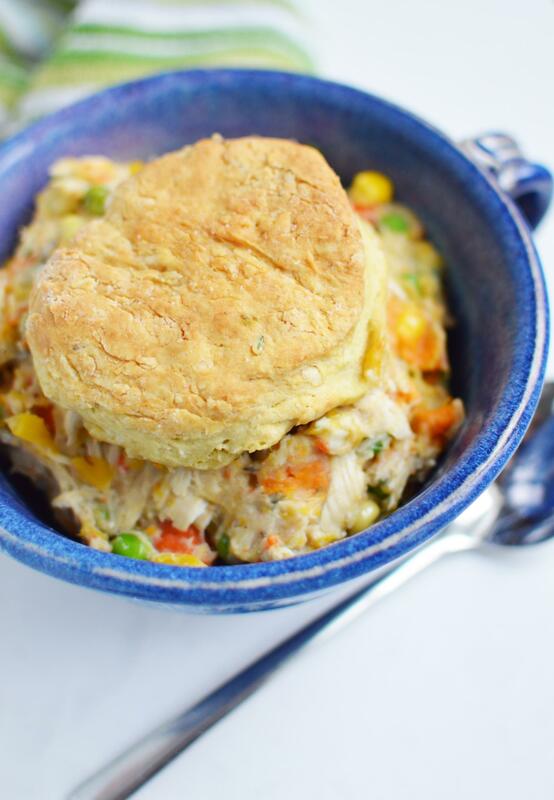 There is greater comfort food to me than biscuits. 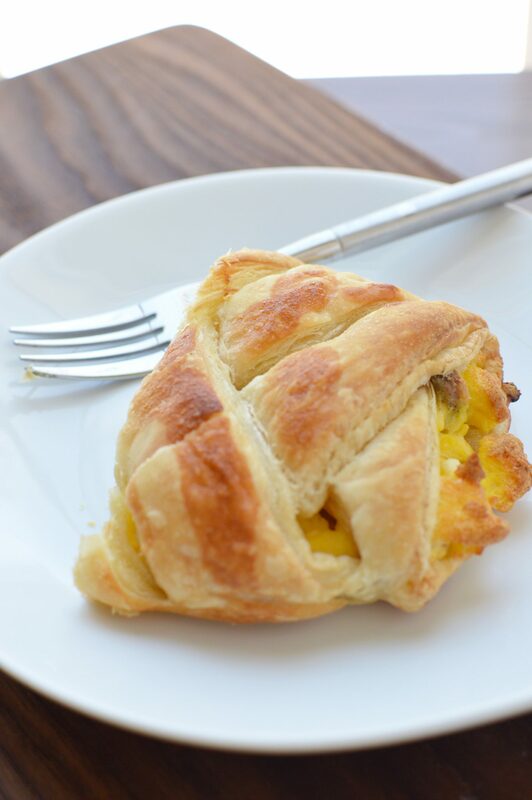 They are such a versatile bread and definitely one of my family’s favorites. 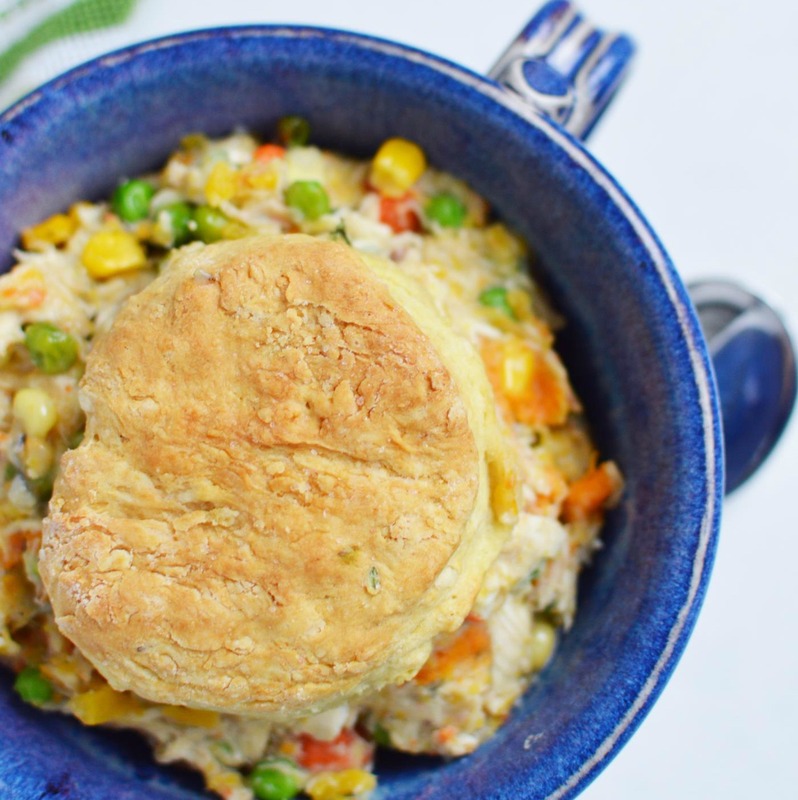 We hope that you enjoy our Skillet chicken biscuit pot pie recipe. Let us know if you try it out! Bon apetit! fresh thyme, the more the merrier, this is what really gives the dish a super homemade taste! 2-4 cups quality chicken stock or bone broth (wide range allows for different thicknesses in the sauce so you may make to your preference). 4 tablespoons butter or butter substitute (plus a little more to go on top before baking). 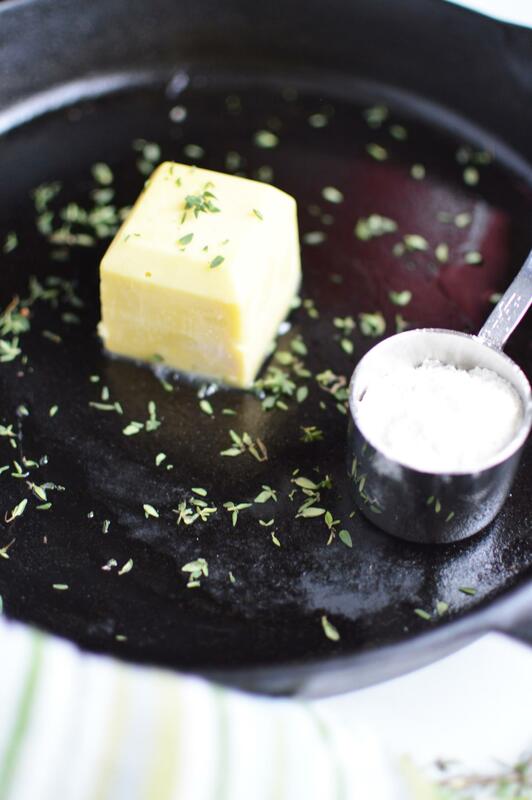 Make a rue for the sauce by heating the butter in your large skillet. 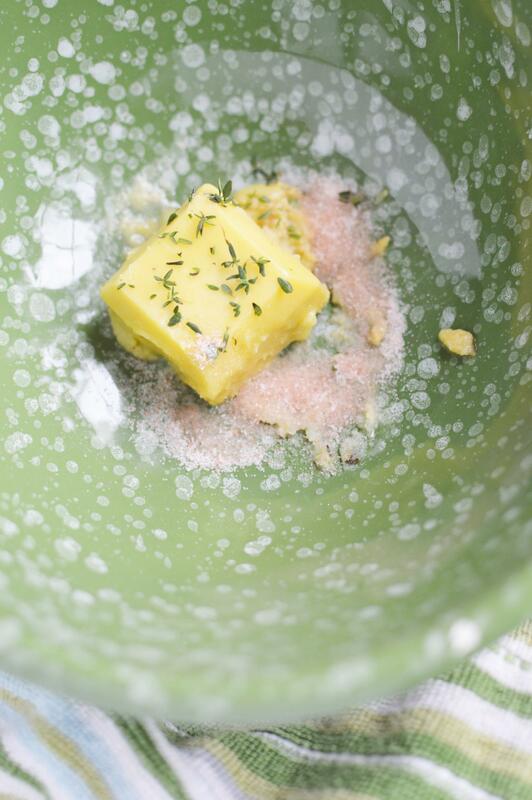 When the butter is bubbling, slowly whisk in the flour, salt and thyme. It will start off being thick and clumpy; continue cooking and bubbling for 1 full minute to cook off the flour taste. Carefully and slowly pour in a little of the chicken stock at a time until you have the thickness you prefer. You can always add more later to thin it out. 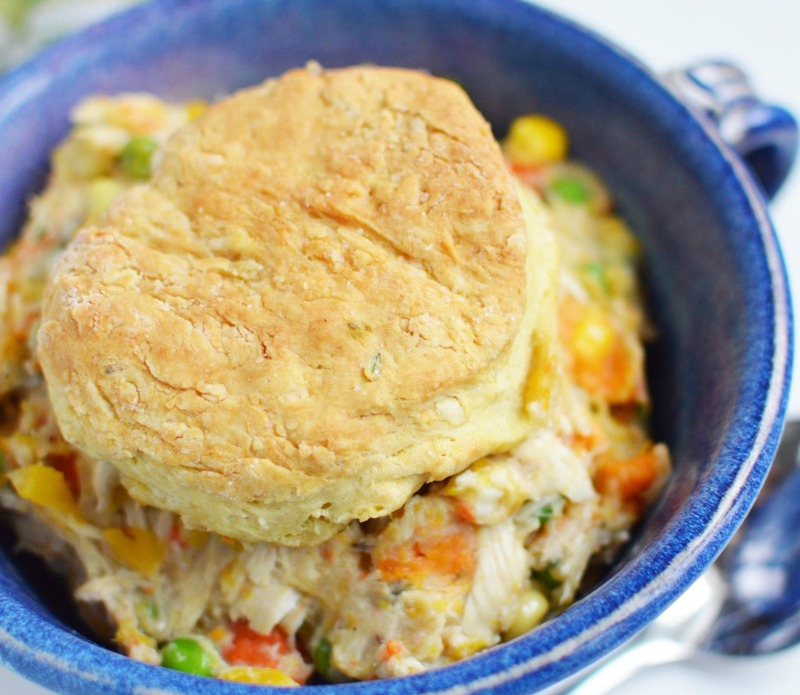 Add in all of your vegetables and chicken, stir to fully combine and then reduce the heat to low or turn off completely while you make the biscuits, but do plan to keep it warm. 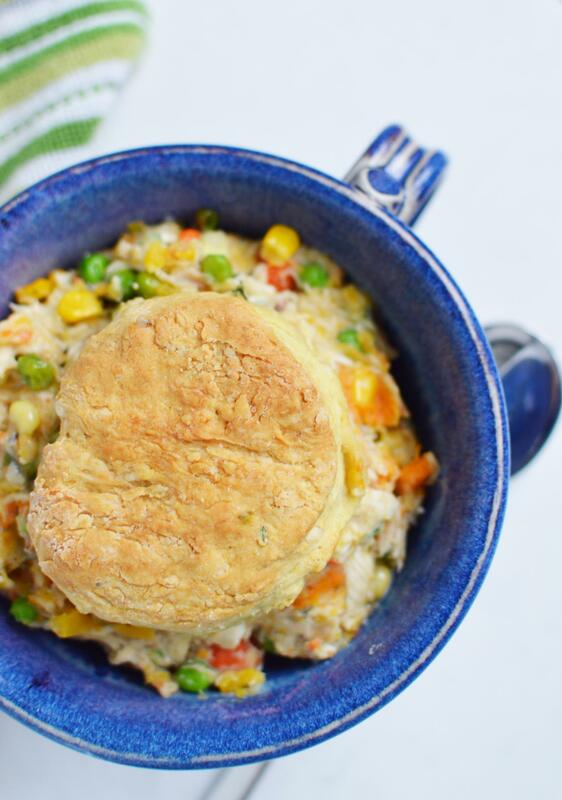 Using a larger bowl than you think you might actually need, combine all of the dry ingredients for the biscuits. Slowly work in the butter with your hands until it is broken down and the flour mixture has an almost damp feeling and sticks when you squeeze it in your hand. Make a small well in the middle and pour in a little milk at a time. Mix in more as needed until the dough is thick and sticky, you may not need the full cup. 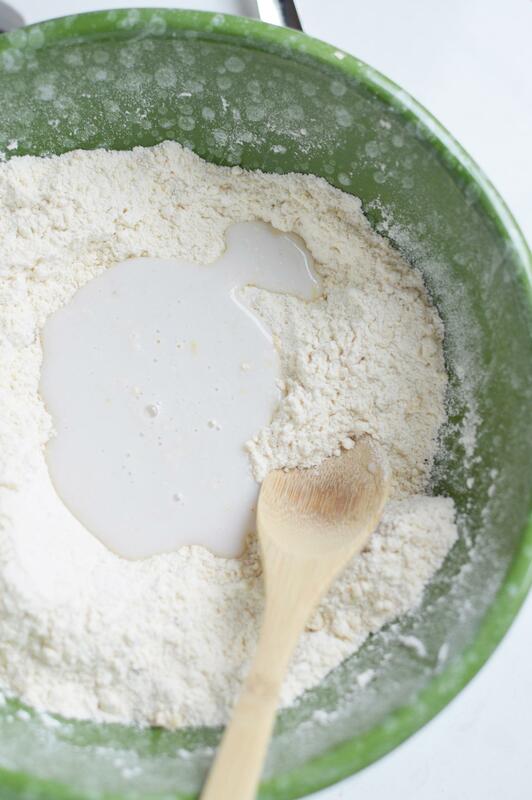 Turn out onto a lightly floured surface and knead and fold over in half and on itself a few times. Try hard not to over work the dough. 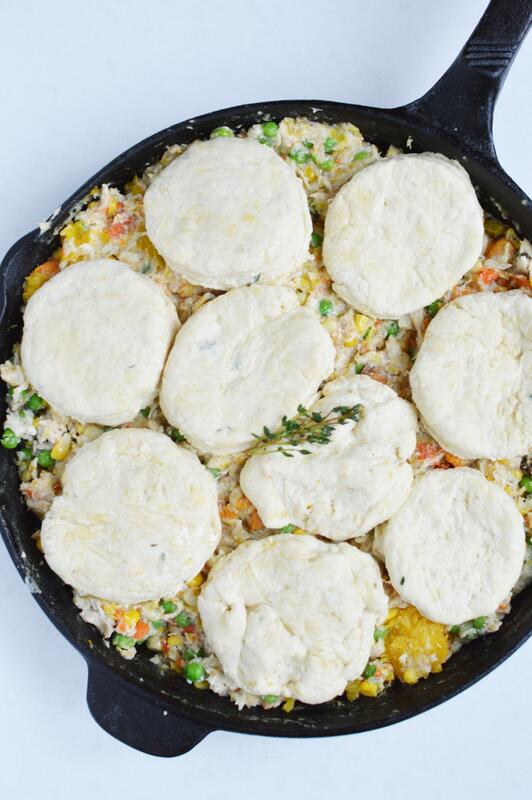 Visualize the size of your skillet and then press the dough down until it is large enough that it should yield enough biscuit to cover most of the surface of the skillet and filling. For us, this typically ends up being about ¾ of an inch thick. 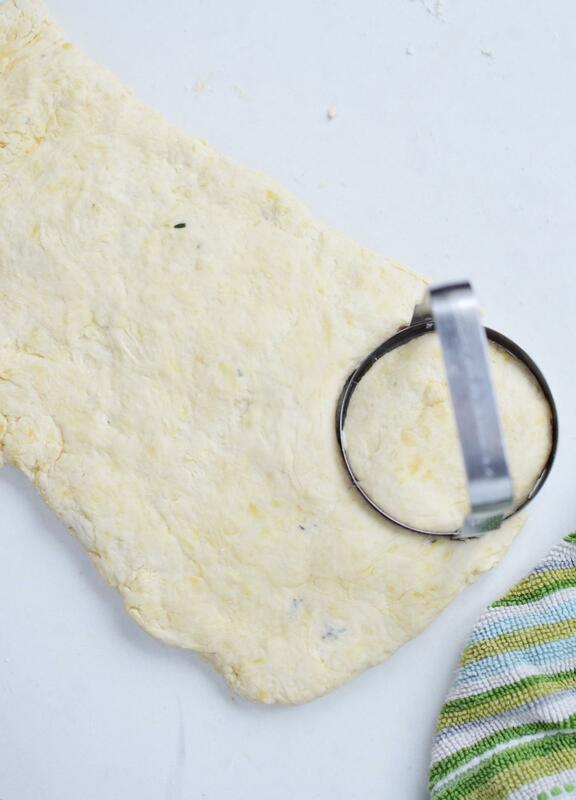 Use a biscuit cutter or clean glass to cut out the biscuits. 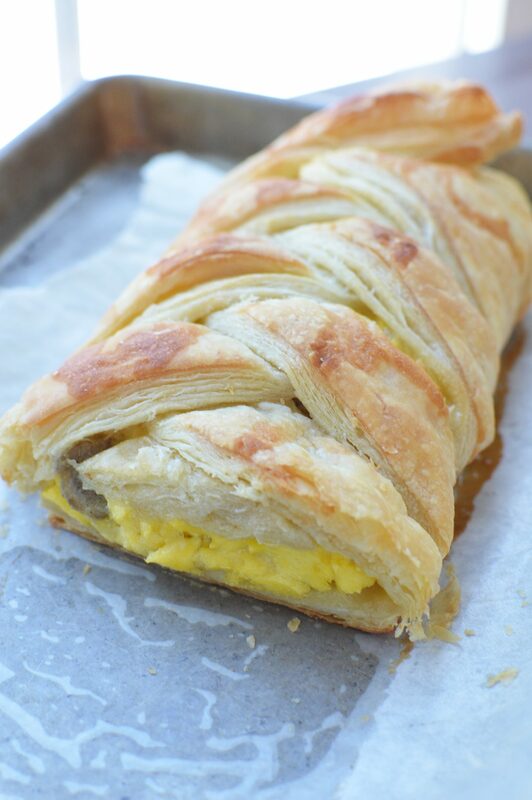 Place on top of the filling (add the optional extra butter and salt now). 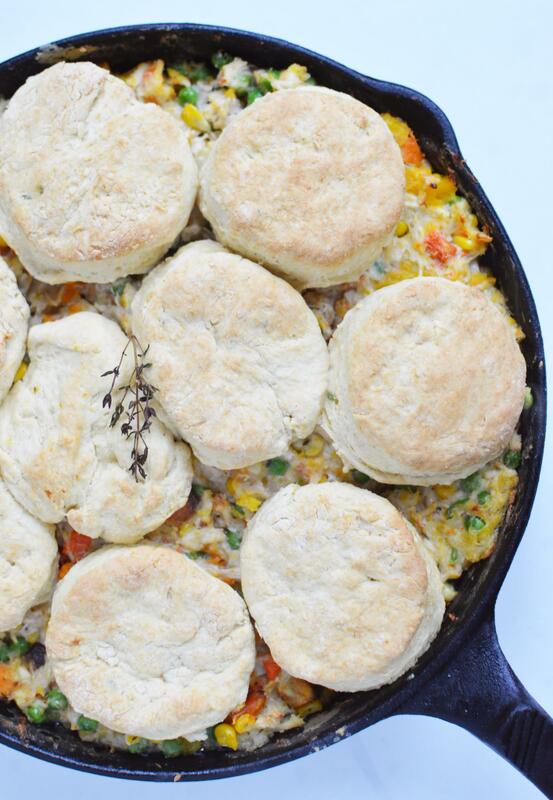 Bake at 400 degrees for about 12 minutes or until the biscuits are golden brown and puffed up. Before removing from the oven completely, carefully lift one of the center biscuits and peak under to ensure they are baked through. 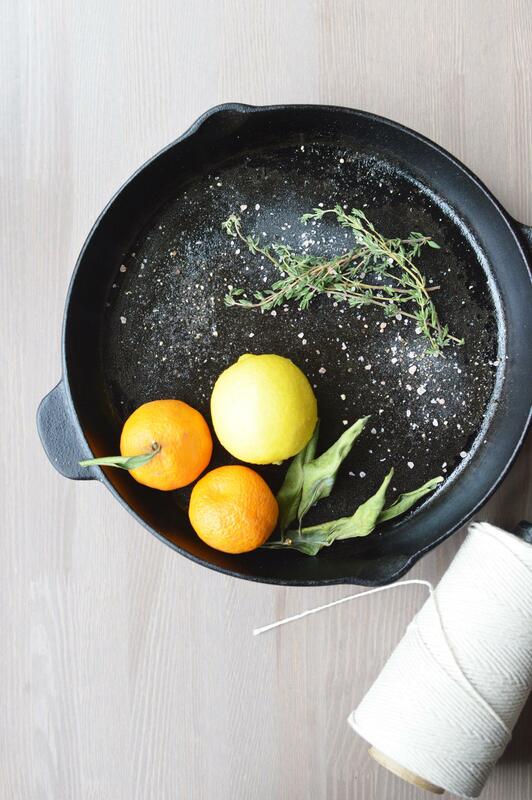 Our top pick for a cast iron skillet is the Lodge Cast Iron Skillet. 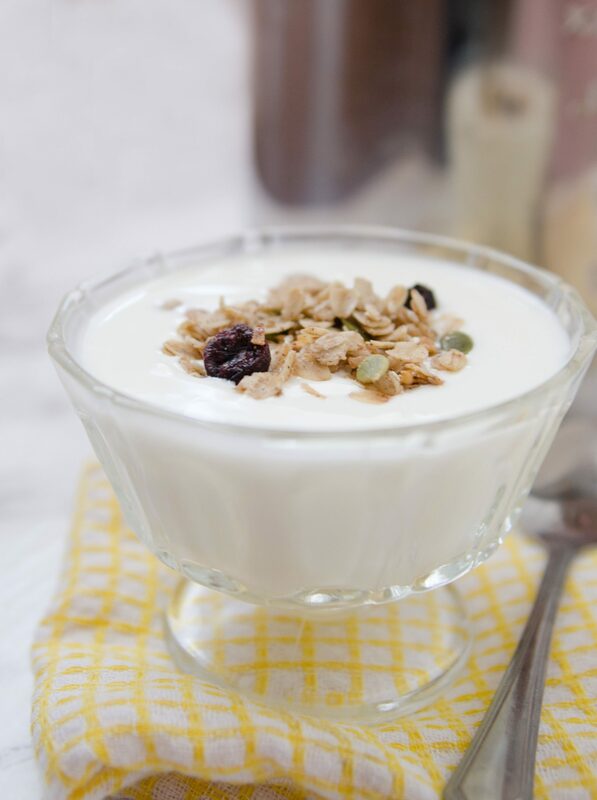 I find yogurt to be one of the most versatile foods in my kitchen at times. I can add some berries and granola creating a protein packed breakfast. I can add fruit and yogurt to my blender for the perfect smoothie. 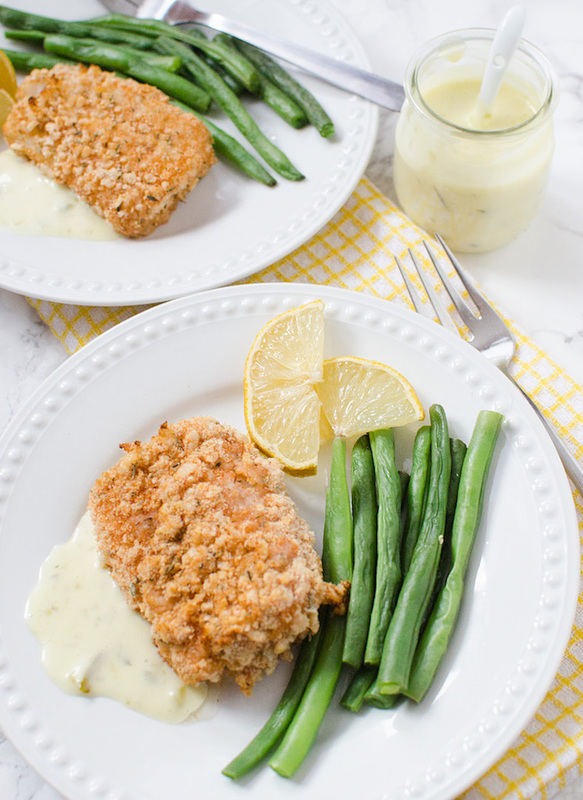 I can use yogurt in a sauce creating an amazing creamy texture. 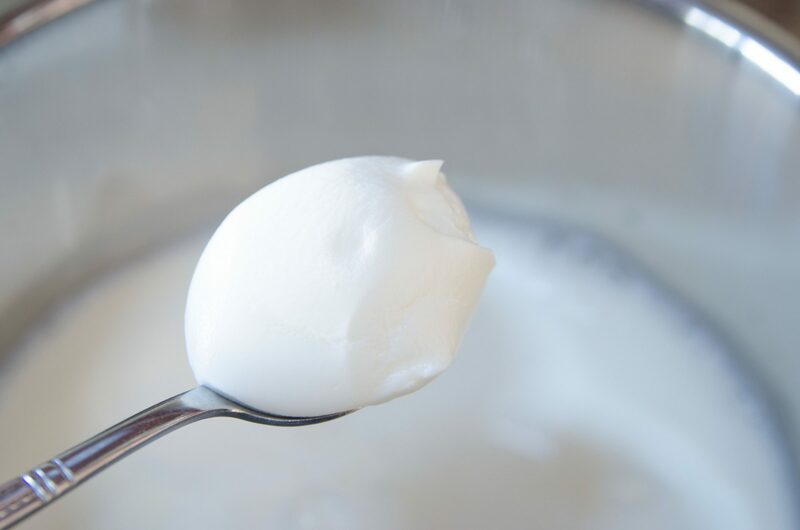 Yogurt can also make thicker salad dressing without a lot of extra calories. We always have a container of plain in the refrigerator along with vanilla plus some other flavors with fruit. 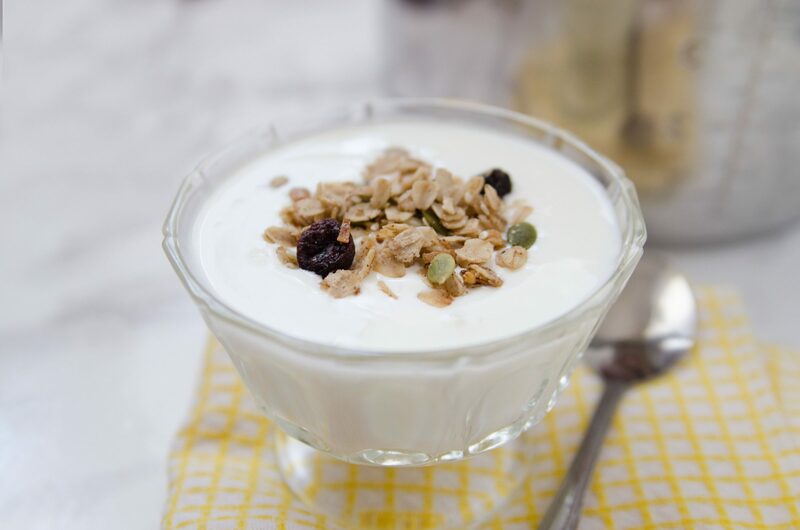 We go through a lot of yogurt. 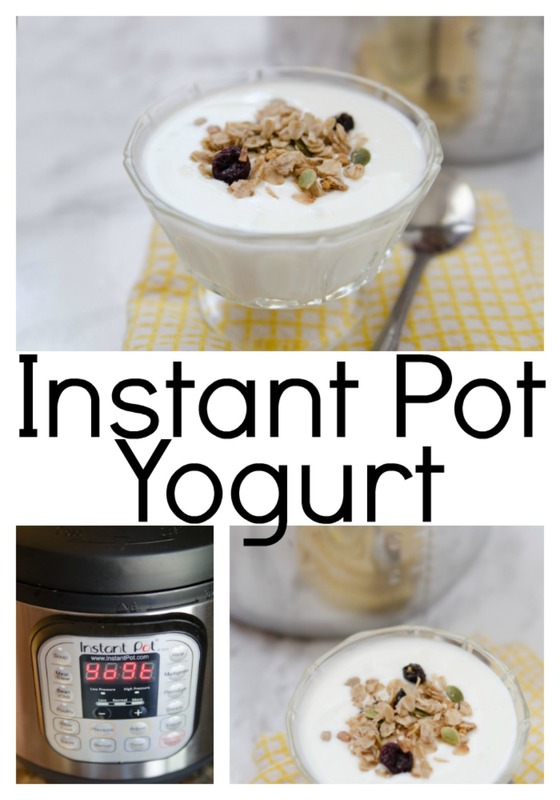 We hope that you enjoy this Instant Pot yogurt recipe. 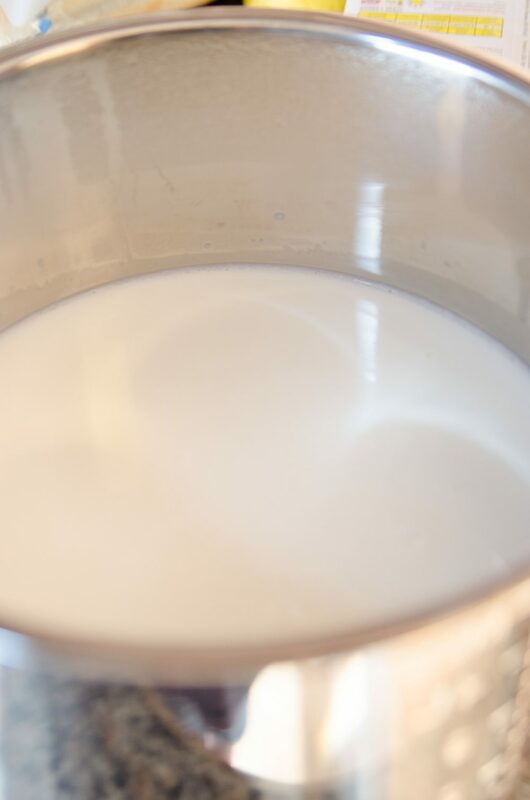 Pour the gallon of milk into the instant pot bowl. 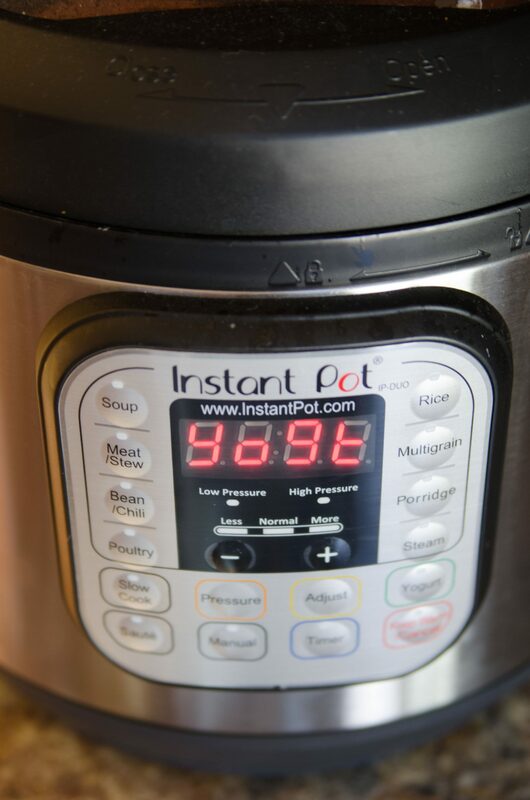 Press the “Yogurt” button until is displays “boil.” Put the top on the pot and let your InstaPot carry out this step. It will beep when it’s complete. When the machine beeps, remove the lid and take the temperature of the milk. It should be in around the 180 degrees mark. If it doesn’t get to 180, repeat the boil step again. Grab an oven mitt to lift out the silver bowl and place on a heat safe surface. Let the milk cool to around the 110 degrees mark. Add the yogurt and stir. Put the bowl back into the machine and press the yogurt button once again. Replace the lid and let the machine create the yogurt for the next 8 hours. 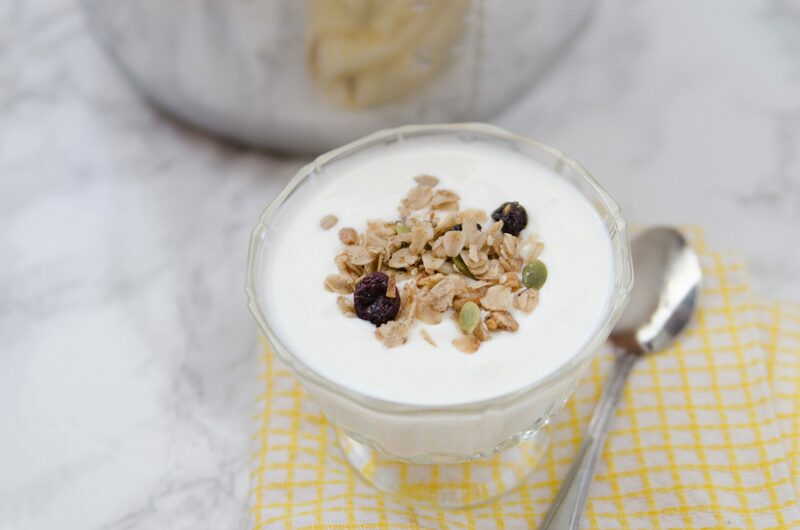 Remove the lid after the time is up, and carefully spoon the newly created yogurt into a container. Refrigerate or serve immediately. 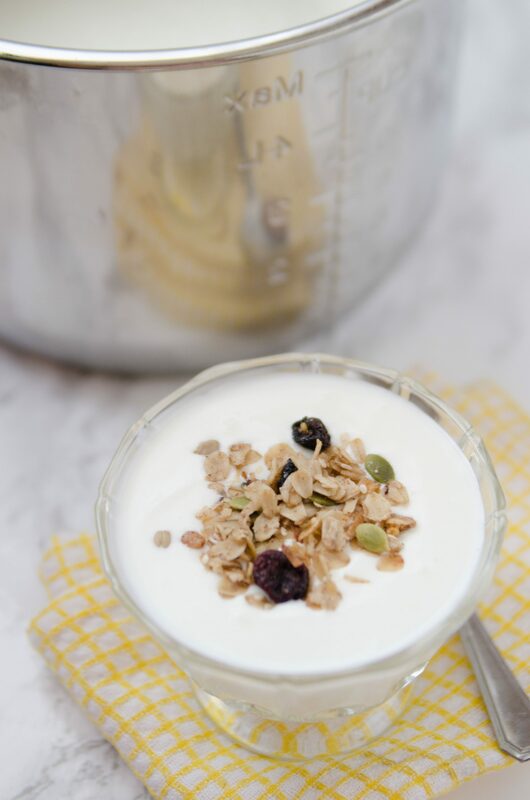 We hope that you enjoyed this Instant Pot yogurt recipe. I am man enough to say that I like my Old Spice. I am pretty certain that my grandfather used to wear Old Spice as well but let me tell you…this is not your Grandpa’s Old Spice. My Old Spice is bold yet doesn’t takeover the room. It just smells rugged and manly. I like that about it. Today we are talking about Head & Shoulders 2-in-1 Dandruff Shampoo and Conditioner Old Spice. Now you can find things infused with the scent of Old Spice like my favorite shampoo. I say favorite because I use it the most. However, I don’t need Head & Shoulders every day so I do try out a few alternates every now and then. This is my dandruff shampoo review. Back to that scent and some important scent advice that my wife gave me. She told me that if I really like the smell of something that I should layer the scent. Find it in a few different products that I use daily and then the scent will be around longer which is pretty much what I wanted. She is absolutely right. Now I just need Tide Old Spice so I can do the entire fam’s clothing. Head & Shoulders 2-in-1 Dandruff Shampoo and Conditioner Old Spice is a dandruff shampoo made specifically for men to fight any dandruff issues that may arise. It is a gentle shampoo that can be used every day and will not damage hair. It can even be used on colored or chemically treated hair. It can be used on any hair type, including damaged, frail, or thin hair. This shampoo also helps to moisten the skin of the scalp, calm itchy and red scalps, and relieve irritation. Head & Shoulders 2-in-1 Dandruff Shampoo and Conditioner for Men Old Spice has been proven in over 200 clinical tests, meaning it is the most tested dandruff shampoo in the world. 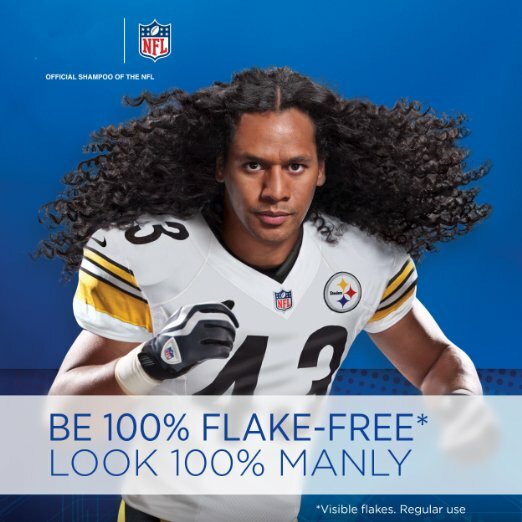 It guarantees that, if used properly, your hair will be 100% flake free. Based on a survey of United States dermatologists in 2013, Head & Shoulders is the number one recommended dandruff brand. The clinical tests have also shown that people who use this shampoo get thicker looking and more hydrated hair. The Old Spice scent is designed for men for a more refreshing feeling. For the best results, this shampoo should be used every time you wash your hair. However, it will still be effective if used only two times per week. Because this is a medicated shampoo, you should be extra cautious to keep away from the eyes and mouth. Even if you don’t have any current scalp problems, this shampoo will promote a healthier scalp as well as hair. 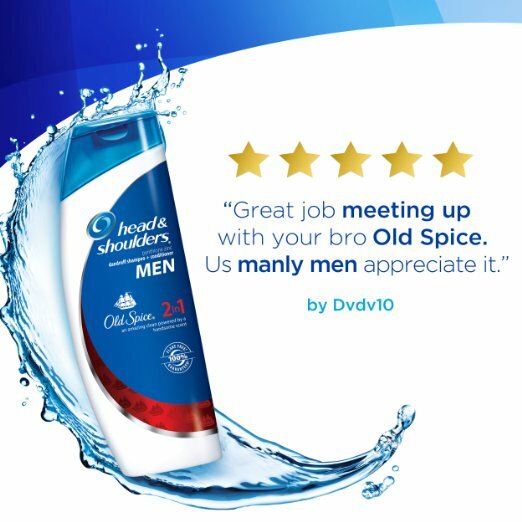 Fights dandruff with a manly Old Spice scent. Clinically tested. 100% Flake Free (2) Guaranteed (3). 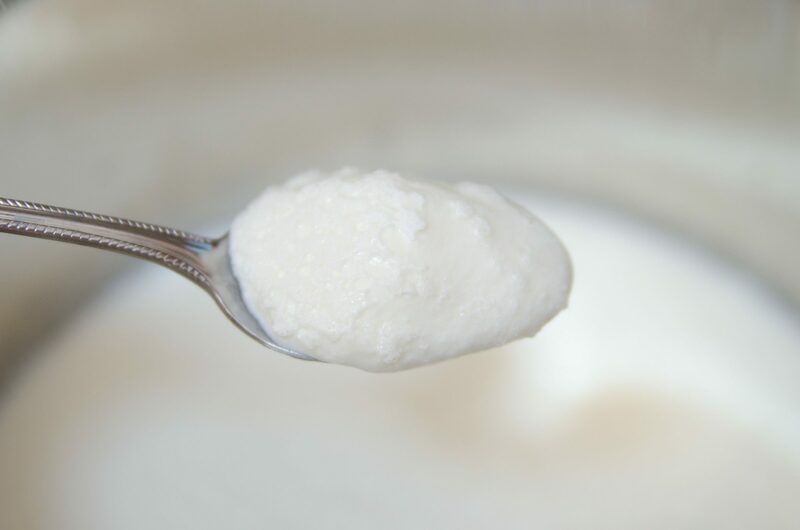 Fights dry scalp, calms itchy scalp, and relieves irritation (4). So yeah…you are reading this on Foodie Father but we all wash our hair, right? 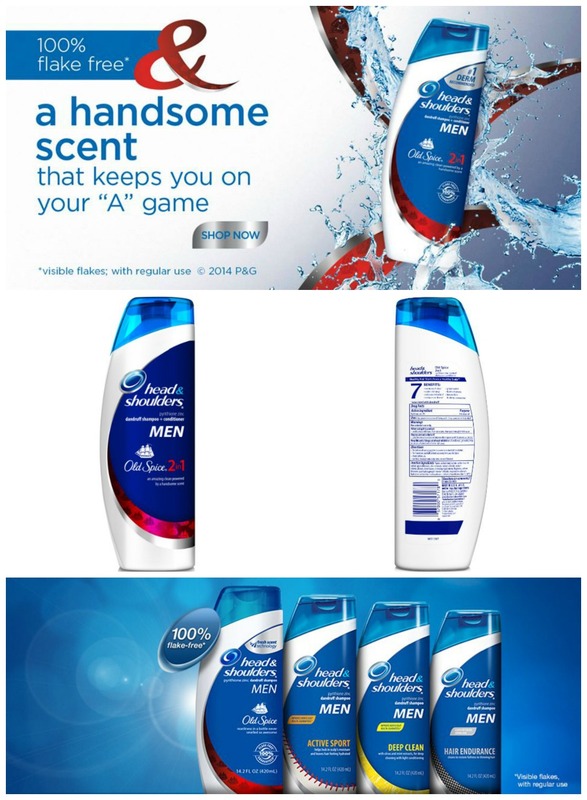 Tell us what you think of Head & Shoulders 2-in-1 Dandruff Shampoo and Conditioner Old Spice. 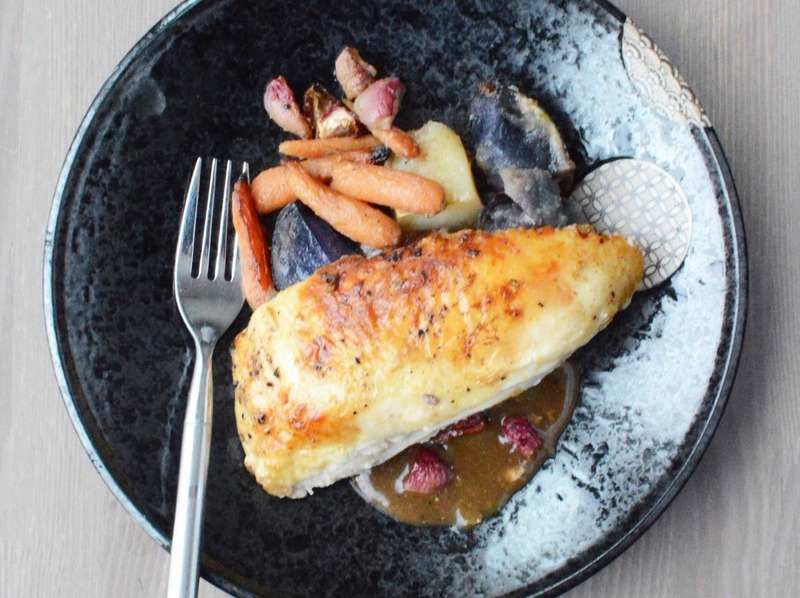 This roasted chicken recipe is very easy to make and tastes amazing every time. 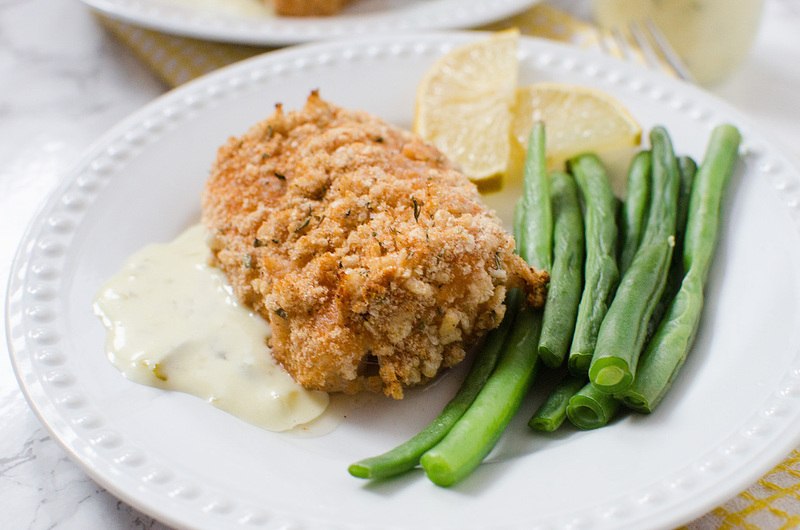 Chicken is one of the staples in our family because it is so versatile and a family favorite. 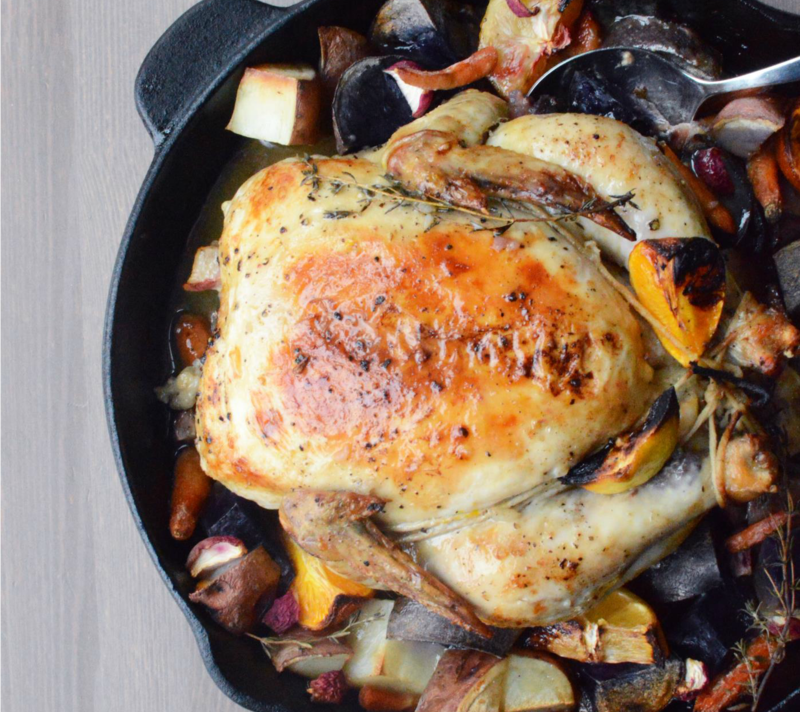 We hope that you love this Roasted Chicken Recipe. Fully wash the vegetables, being sure to scrub the skins before cutting into uniformly sized pieces. Remove anything in plastic or unwanted from the inside of the chicken, tie if needed and then place in the center of the oven safe pan on top of a bit of olive oil salt and pepper. 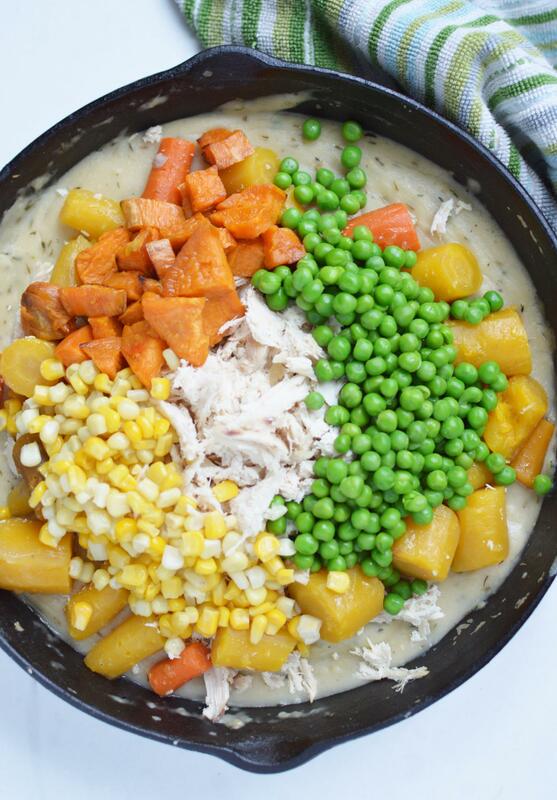 Add as many vegetables around the chicken as possible. Drizzle the top of the chicken with the rest of the olive oil and then dust with a bit more pepper and sea salt. Pour the chicken stock or broth into the bottom of the pan. 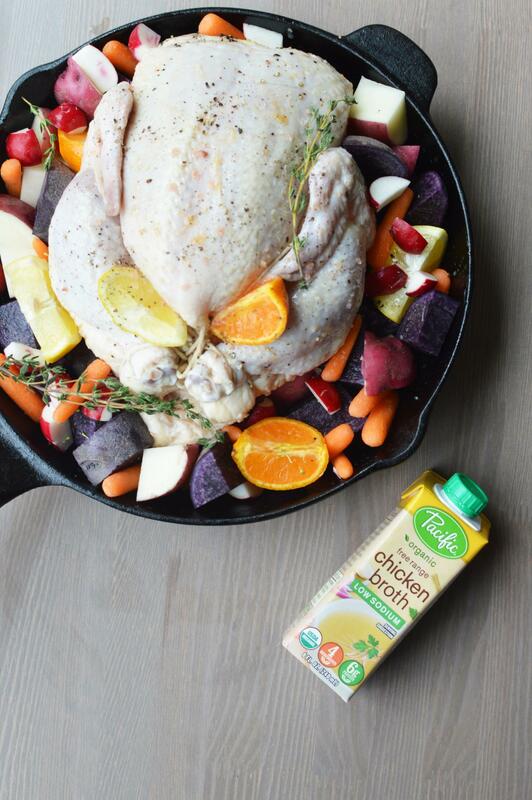 While the chicken is cold, form a piece of tinfoil over the top of the chicken and vegetables. 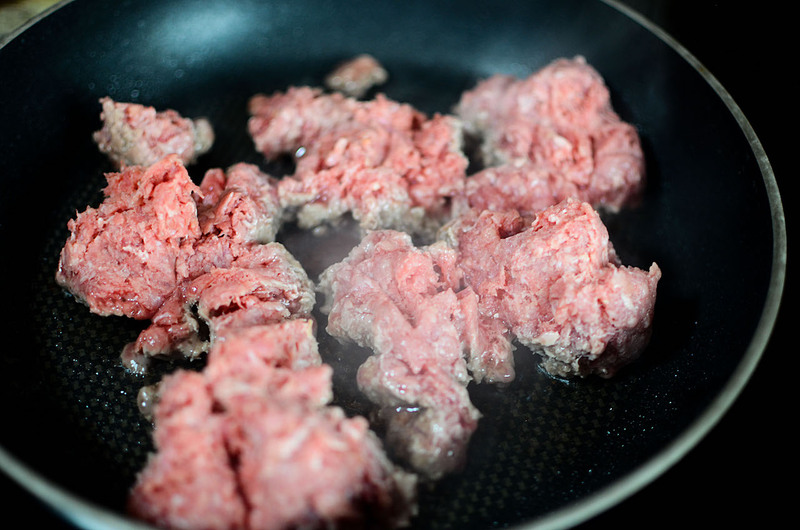 Carefully remove and set aside-keep in mind this has now touched raw meat. 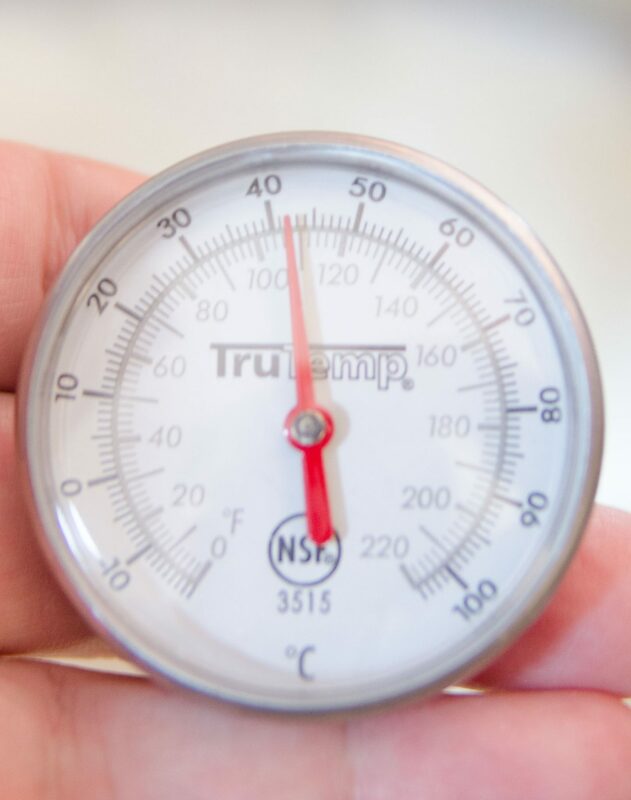 Place the chicken in the oven and cook for 20 minutes at 400 degrees, this will allow the chicken to brown on the outside. Then cover with your preformed tinfoil and cook at 375 for 25 minutes per pound. 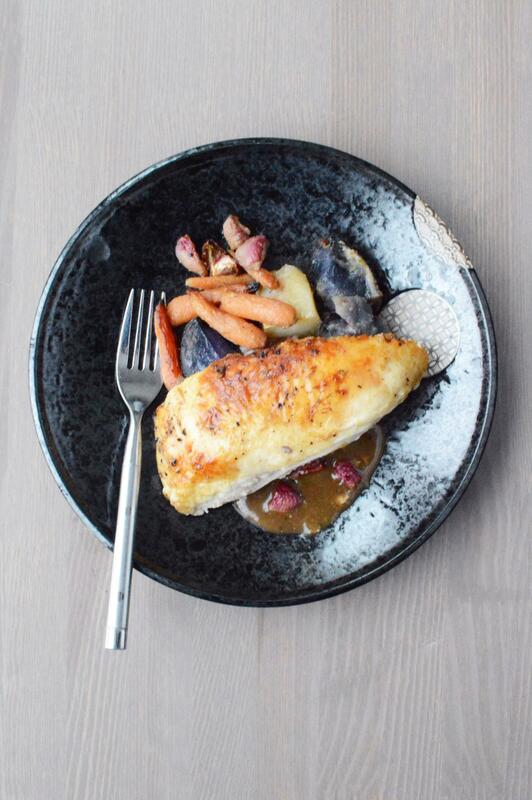 The chicken is done when the inner meat, away from the bone reaches 165 degrees. Make sure all liquid running off the meat is clear. If it is tinted pink at all it is not done yet. Allow the chicken to rest and cool for a few minutes before cutting into it. 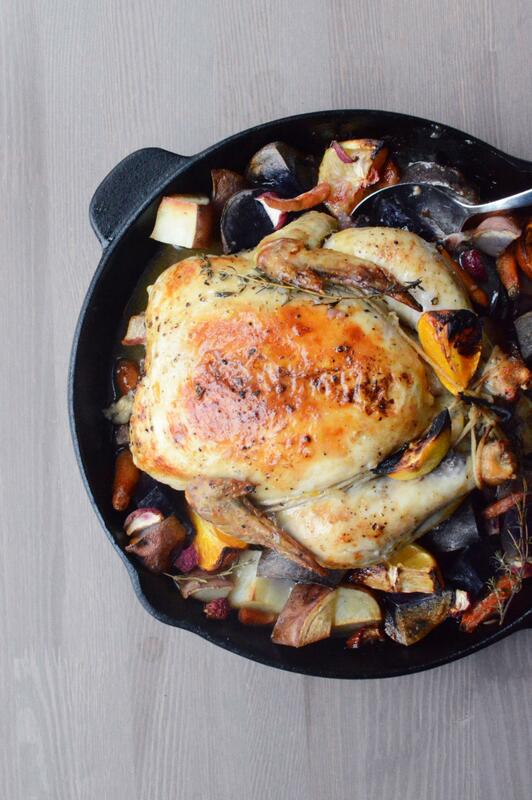 We hope that you loved this Roasted Chicken Recipe. Ever since my first visit to France many years ago, I have had a slight obsession with the country. My favorite thing to do was just to visit all of the little shops featuring all of my favorite things. The butcher, the cheese shops, the chocolatier and the bread; we truly loved them all and our goal was to bring back a little France with us. 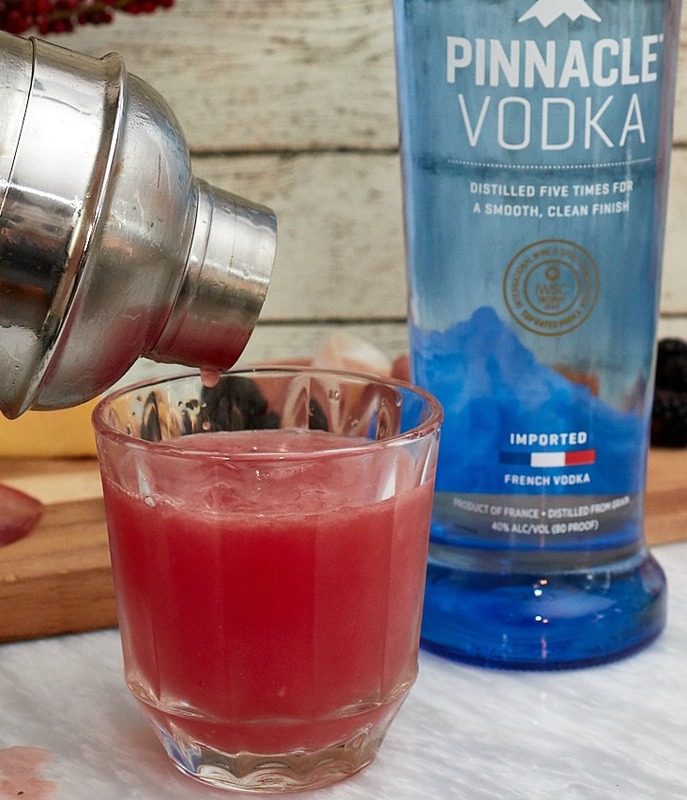 We are partnering with Pinnacle® Vodka to host an elegant French-themed party look. They even sent authentic serving pieces from France, traditional snacks and of course, French vodka. 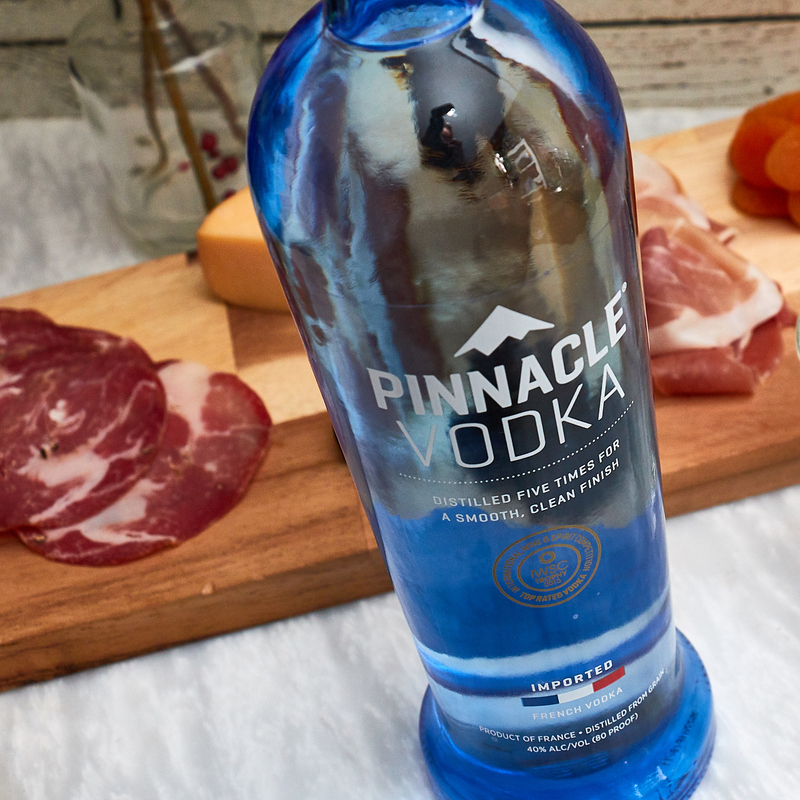 We hope that you find inspiration with this French Inspired: Appetizers and Cocktails featuring Pinnacle Vodka post. 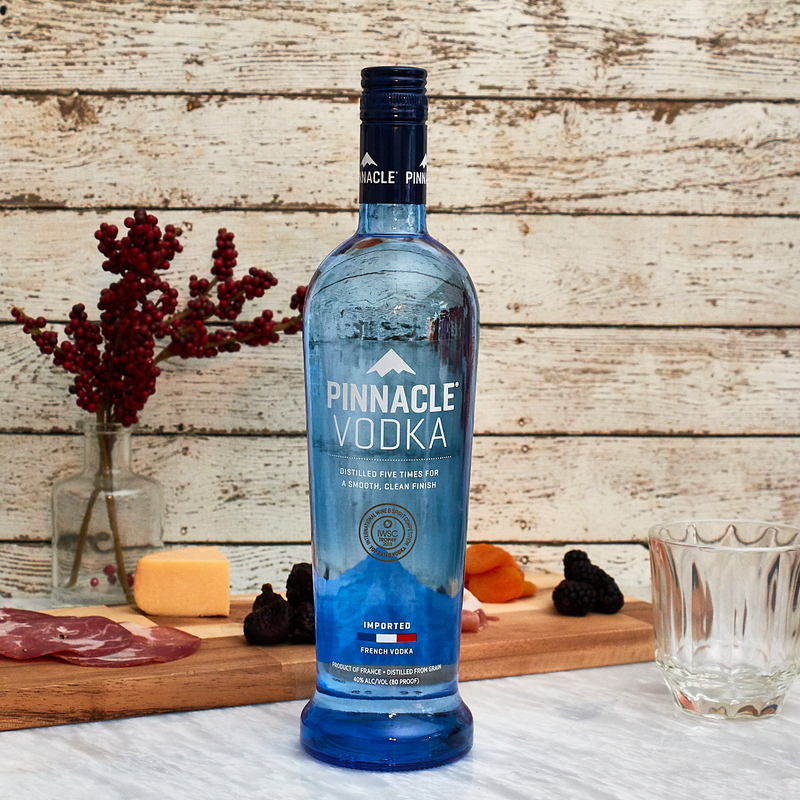 Pinnacle® Vodka is known for their exceptional quality. Created with the finest French ingredients and distilled five times in the Cognac region of France, you get an incredibly smooth and clean taste. Pinnacle® Original Vodka, the most awarded French vodka, has won 19 awards since 2013 (for taste and quality) and is ultimate combination of both value and quality. 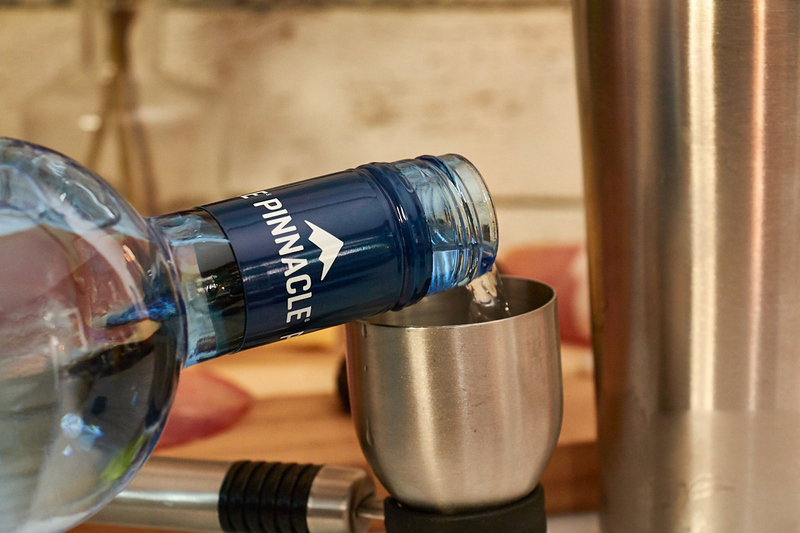 Pinnacle is truly the most perfect go-to Vodka for parties, special occasions or for everyday. Short of trotting out some French poodles and getting an Eiffel Tower replica, we want to give you an idea of exactly what you need to host a French themed party without going too overboard. The French love to immerse themselves in the outside. A party is instantly elevated by the rustic look and feel of the outdoors. If you look at parties the French throw, you will notice that place settings and tables are never overdone rather they revel in their simplicity. Keep your decor and the items on your table to a minimum. The French love to nibble on hors d’oeuvres. Rather than having a heavy seated dinner, consider a charcuterie board, delicious French cheeses and fresh baguette breads. Add dips, fruit and nuts for a complete table. 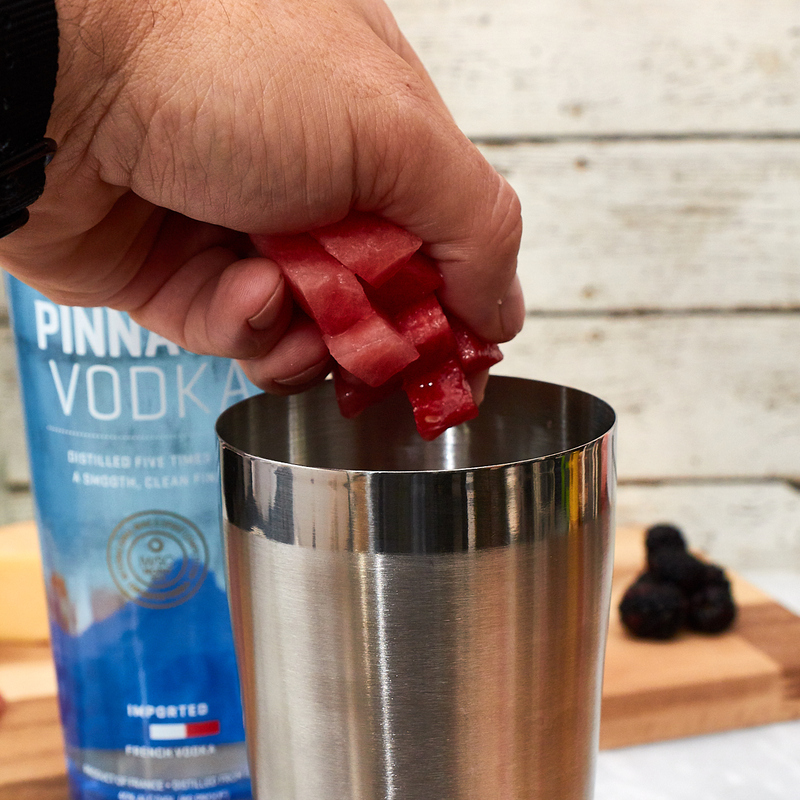 Create a signature drink with Pinnacle® Original Vodka. That is exactly what we did and our drink is amazing if we do say so ourselves. Check out the recipe below. 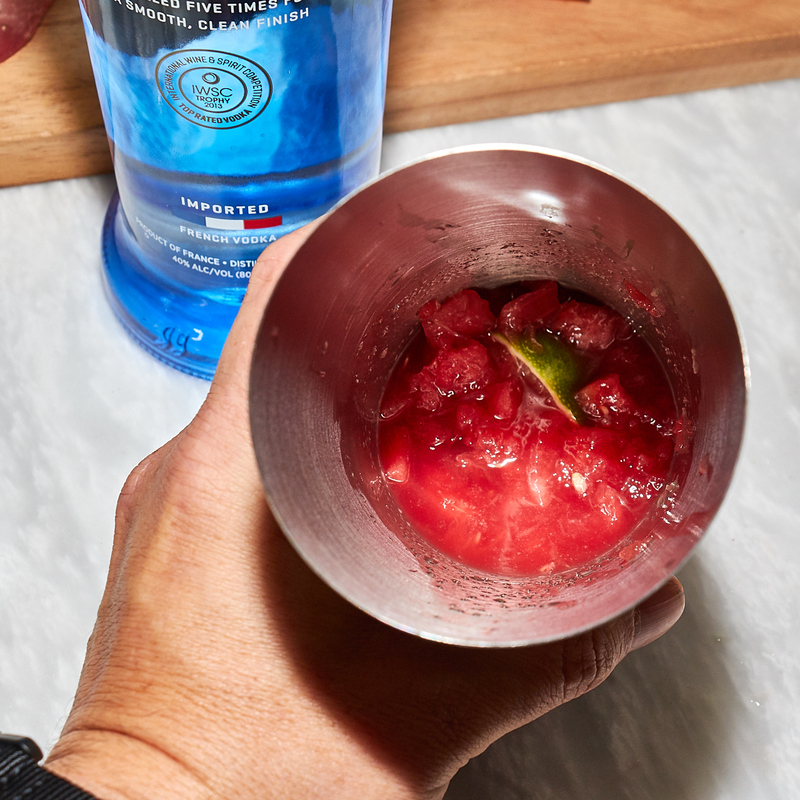 Take the watermelon and muddle it well with a wedge of lime in a large glass. Add about 1/2 teaspoon of honey (or more if you like it sweet). 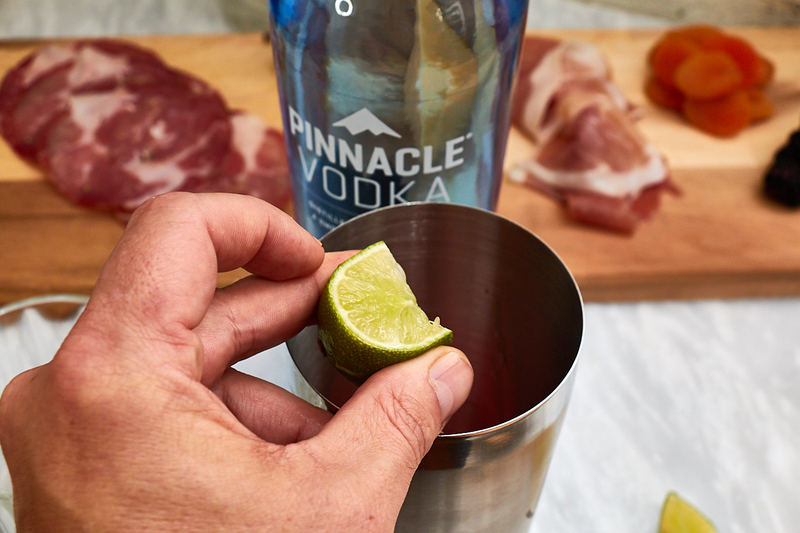 Add 1 1/2 parts of Pinnacle® Original Vodka (the big side of jigger). special occasions. 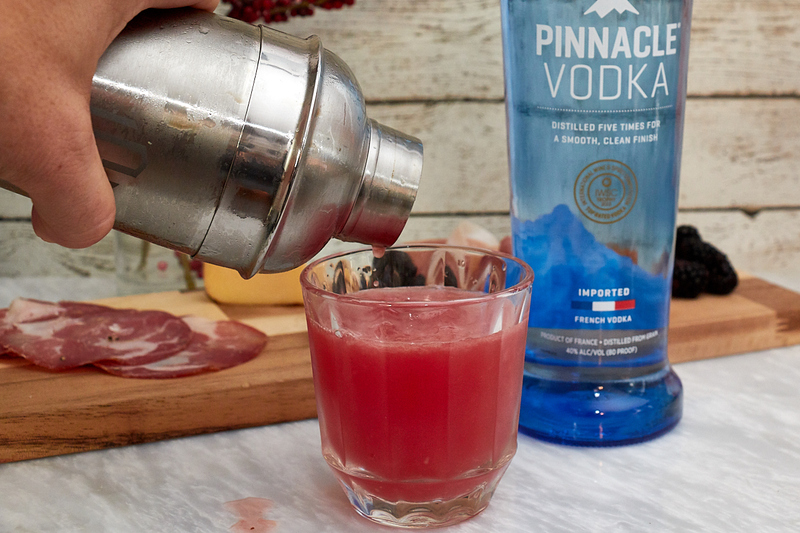 We hope that you enjoyed our French Inspired: Appetizers and Cocktails featuring Pinnacle® Vodka post and are inspired to try your hand at French-entertaining. 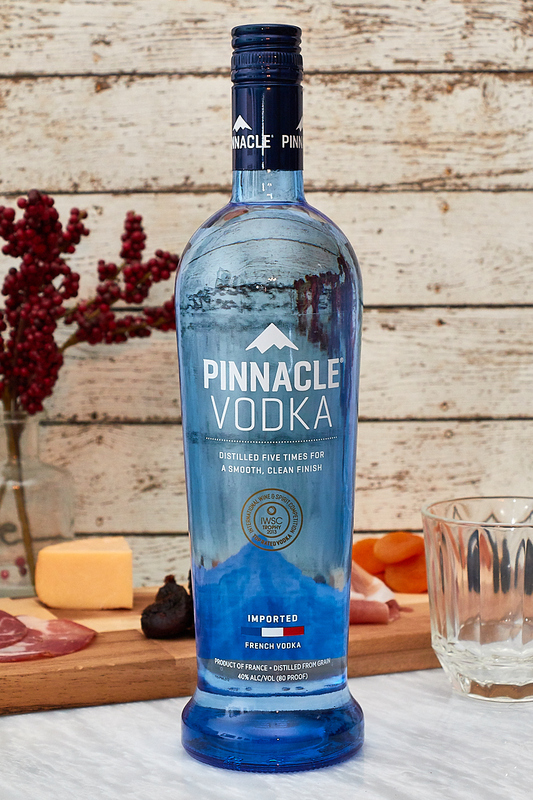 Visit Pinnaclevodka.com to find Pinnacle® Original Vodka near you. IMPORTANT INFO: Drink Smart® Pinnacle® Imported Vodka, 40% Alc./Vol. Distilled from Grain, ©2018 Portfield Importers, Chicago, IL, USA; All trademarks are the property of their respective owners. Let’s talk fish today. I have the toughest time ever getting my kids to eat fish. They will eat chicken, steak and pretty much anything else but no matter what I do, they never seem impressed enough to eat the fish. I mean they might try it and then eat everything else on their plates but most of the time, my wife and I are the only ones who eat the fish. 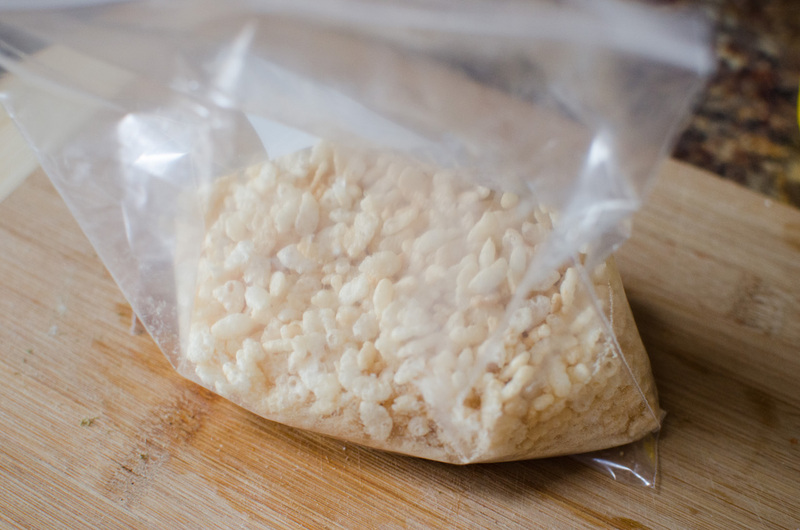 Enter Rice Krispies. 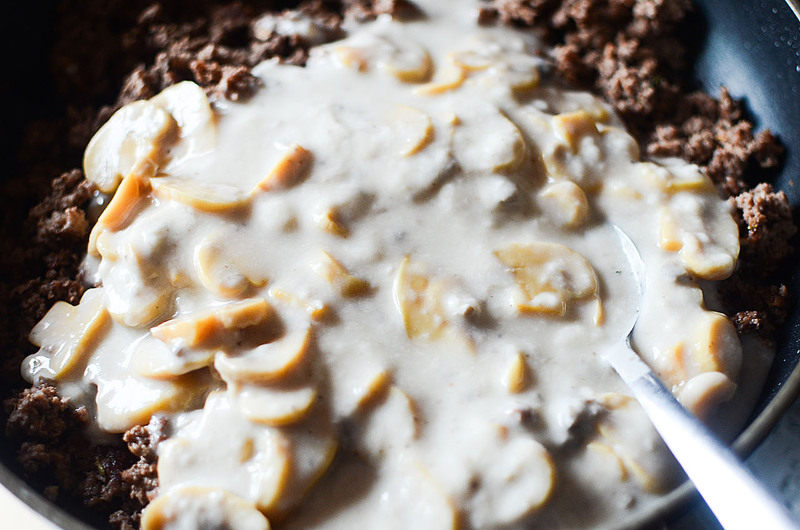 This cereal is a little sweet on its own and it makes your fish taste amazing. 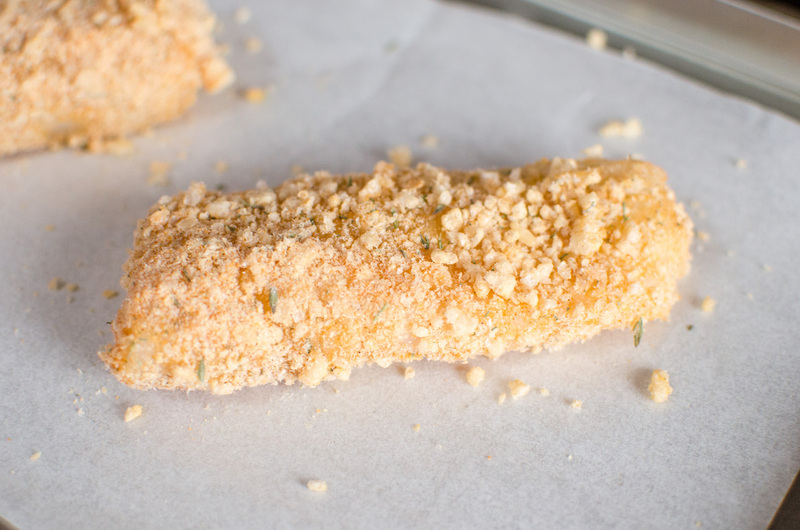 You’ll get a delicious, crunchy batter that even the kids love. We did have to tell them it was coated in cereal and once they tried it, they loved it. SCORE! 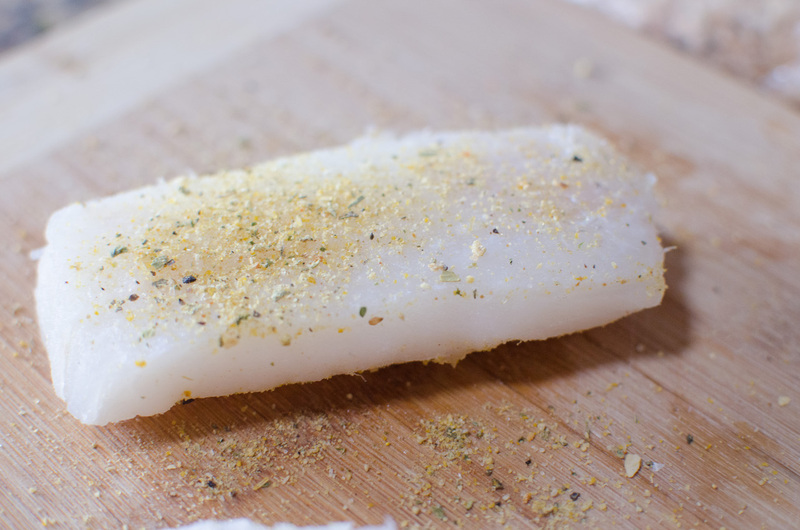 We hope that you enjoy this Rice Krispies Coated Oven Baked Cod Recipe. Season the fillets with 1 tsp of lemon pepper seasoning and salt, set aside. 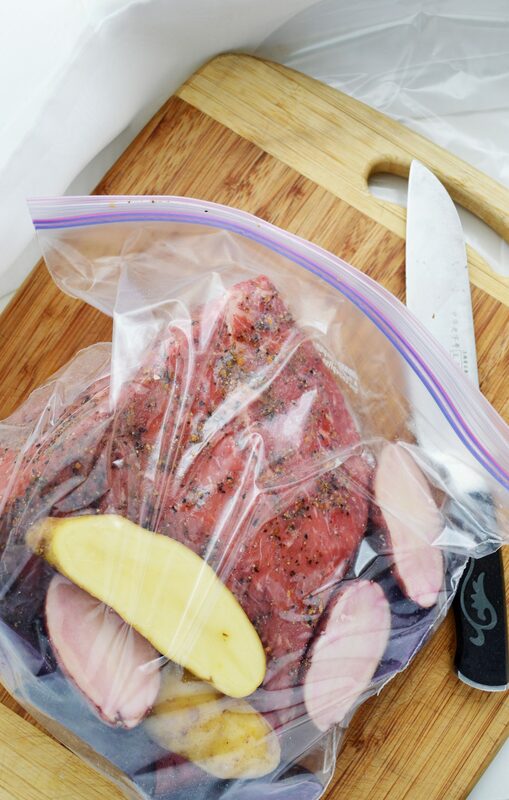 In a sandwich bag, place the cereal, along with the garlic powder, seasoned salt, pepper, thyme, and remaining lemon pepper seasoning. 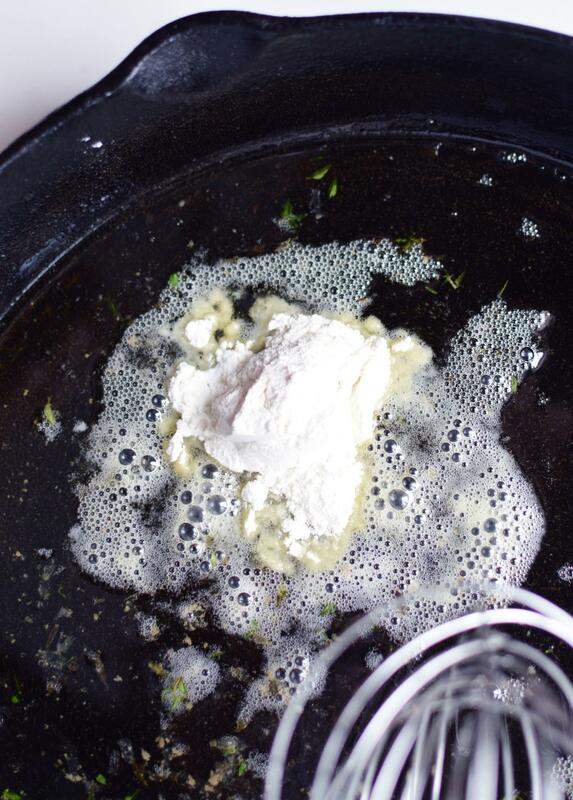 Dip the fillets into the whisked eggs, and then drop each fillet separately into the crumb mixture. Coat well. 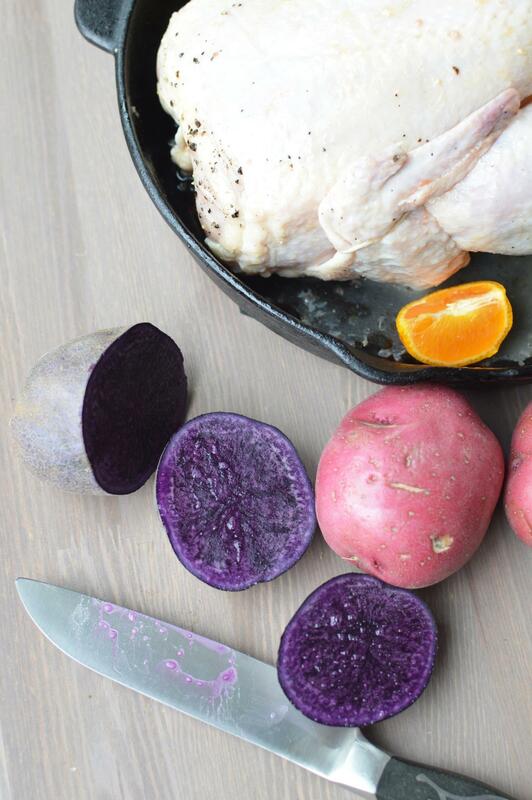 Place all fillets onto a parchment lined baking sheet. Spray the fillets lightly with non stick cooking spray. This helps in the browning process and is optional. 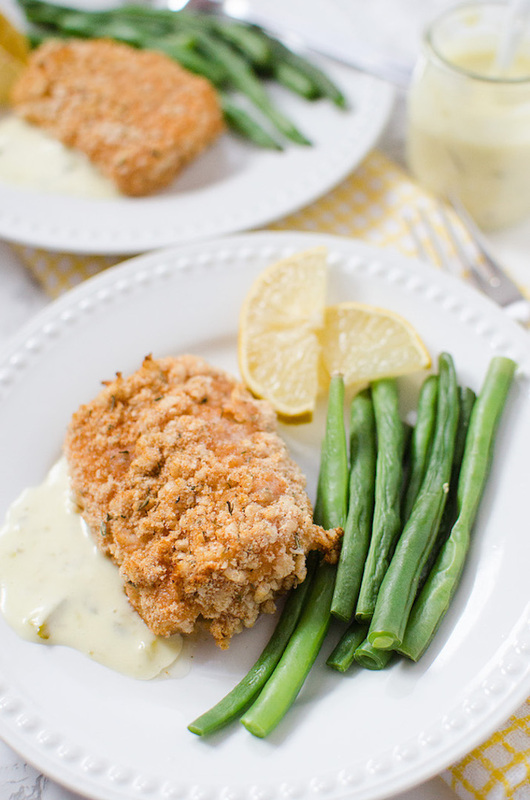 Bake the fillets for approximately 15 minutes or until cooked thoroughly and golden brown. 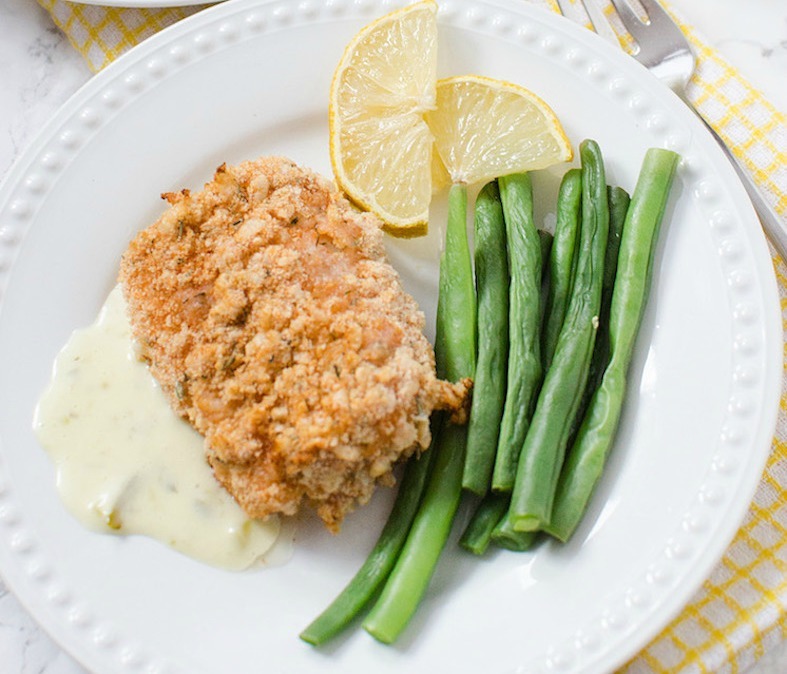 We hope that you are inspired to try our Rice Krispies Coated Oven Baked Cod Recipe.